The Husainid Dynasty is the former ruling dynasty of Tunisia originally of Cretan-Turkish origin. They came to power under Al-Husayn I ibn Ali at-Turki in 1705 replacing the Muradid Dynasty. After taking power the Husainids ruled as Beys with succession to the throne determined by age with the oldest member of the dynasty becoming Bey. The heir apparent to the Bey held the title Bey al-Mahalla. The Husainids originally ruled under the suzerainty of the Ottoman Empire. In 1881 Tunisia came under the control of France as a protectorate. Following independence from France on March 20, 1956, the Bey Muhammad VIII al-Amin assumed the title of King and reigned as such until the prime minister Habib Bourguiba deposed the dynasty and declared Tunisia a republic on July 25, 1957. Husayn tried to establish a succession to the title of bey for his sons Muhammad and Ali (born in 1710 and 1712, respectively). His nephew Ali Pasha, who had been plotting against him and had been therefore put under surveillance by Husayn, was able to escape and revolted, with the help of local tribes and of the Dey of Algiers. The latter invaded Tunisia and defeated Husayn the battle of Smindja (4 September 1735), the latter forced to flee to Sousse, while his troops in Tunis capitulated. Husayn, who had fled to Kairouan and tried to keep governing on Sousse and the Tunisian Sahel. Ali ordered his son Younes to besiege him. Husayn was captured and beheaded on 13 September 1740. In 1724 he obtained the title of pasha by the Ottoman sultan. Muhammad and Ali, fled and continued the civil war, one from Constantine and the other from Algiers. In 1741 Ali conquered the island of Tabarka from the Republic of Genoa, deporting 1,500 Christians to Tunis. In the same year he sent an expedition against the French Cap Nègre, which was captured by his son Younes. In his late years Ali had to face two rebellions. The first one was that led by Younes himself, who was able to seize Tunis, having the local authorities to proclaim him bey. Ali besieged him in the citadel, and forced him to flee to Algiers. The second came from the sons of Husayn, who were able to gain support from the dey of Algiers and invaded Tunisia with an army led by the dey of Constantine. The army reached Tunis, whose walls Ali had restored and stranghtened with a ditch in the meantime. However, this did not prevent the Algerians to storm the city on 31 August 1756. Ali was deposed on the following 2 September and brought in chain to Algiers, where he was strangled twenty days later by partisans of his successor Muhammad I ar-Rashid. He was in rebellion from Aug 1756. 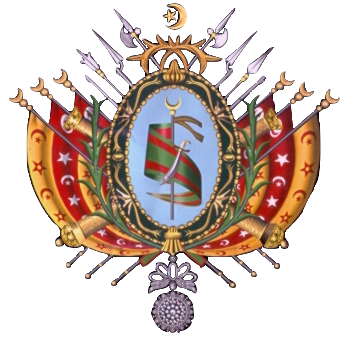 Assumption of the Turkish title of Pasha, 1759-1881. From the early 18th century, Tunis had become increasingly autonomous from Istanbul, and by the late 18th-early 19th century, was effectively Independent. 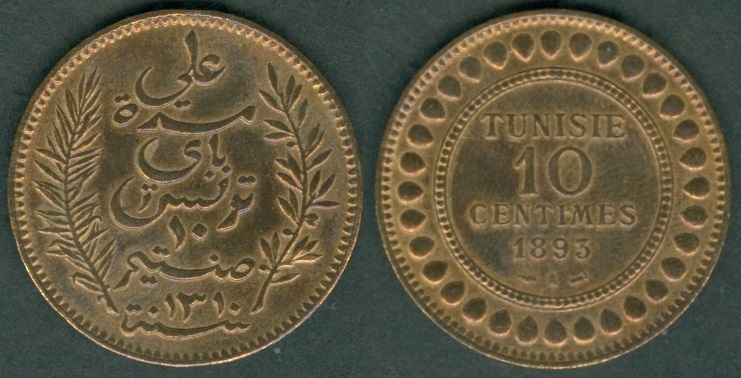 The rulers of Tunis ceased tribute payments in 1871, thereby establishing an independent (albeit not formally recognized) state. France established a protectorate over the region 10 years later. When he abdicated, he signed the Treaty of Bardo with France on 12 May 1881 signifying Tunisia as a French Protectorate. He was born at the Palace of Bardo the only son of Prince Muhammad al-Ma'mun Bey. He was appointed heir apparent with the title Bey al-Mahalla on May 12, 1906. He succeeded as Bey of Tunis on the death of his cousin Muhammad V an-Nasir. Muhammad VI died at Carthage having been married three times with two daughters and three sons including Muhammad VIII al-Amin. On 14 January 1928 he became the Bey al-Mahalla (crown prince) of Tunis, and thus the lieutenant-general of the Beylical Army, and became bey upon the death of his cousin Muhammad VI al-Habib. Ahmad died at La Marsa and was buried at the Turbat al-Bey. He was succeeded by his cousin Muhammad VII al-Munsif. Ahmad II had ten sons and eight daughters, including Prince Muhammad al-Taib Bey (1902–1989) who was the head of the Husainid Dynasty from 1974 until 1989. Muhammad became bey of Tunis on the death of his cousin Ahmad II ibn Ali. In 1942 he attempted to free Tunis from French control and establish an independent government. The Free French Forces deposed Muhammad on May 14, 1943, on the accusation that he was a Vichy collaborator and he was succeeded by his cousin Muhammad VIII al-Amin. He formally abdicated on July 6, 1943. After his deposition, Muhammad was exiled firstly to Laghouat in southern Algeria, then to Ténès, before finally moving in 1945 to Pau in France, where he died in 1948. 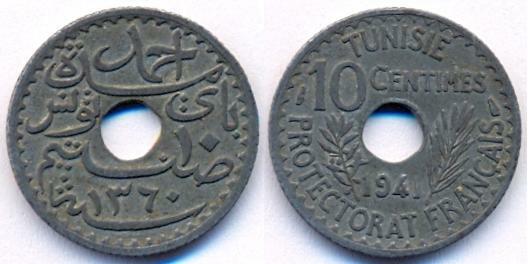 Tunisian documents and coinage refer to the state as a Kingdom from 1950. Muhammad became bey after the Free French Forces deposed his cousin Muhammad VII al-Munsif on the accusation that he was a Vichy collaborator. On 20 March 1956 he proclaimed the independence of Tunisia and became King of Tunisia with the style of His Majesty. A monarchy did not meet the expectations of future president Habib Bourguiba, who replaced the Royal Guard at Carthage Palace with his own loyal soldiers. By his command all the telephone lines to the palace were cut and the king put under house arrest 15 July 1957, and on 25 July the Tunisian Constituent Assembly deposed the king. Muhammad was moved to a government-watched residence at La Manouba, but was permitted to return to Tunis after his wife died. He never abdicated his throne rights. He died in Tunis and was buried at the Tomb of King Muhammad al-Amin. Muhammad was succeeded as head of the Husainid Dynasty and heir to the throne and titular king by Husain Bey. Muhammad ibn al-Husayn Bey coinage: 1856 - 1859 [AH 1272-1276] citing Ottoman Emperor: Abdul Mejid Khan. Currency: Riyal Sebili (Piastre) = 16 Khurub (Caroub) = 52 Nasri (Asper) = 104 Fals (Bourbe) = 624 Qafsi (Fals Raqiq or Bourbine). KM#132 2 Khurub. Year: AH 1273 (1857 CE). Weight: 0.44g [0.40g]. Metal: Bronze. Diameter: 13.00 mm. Edge: Reeded. Alignment: Medal. Mint: Tunis. 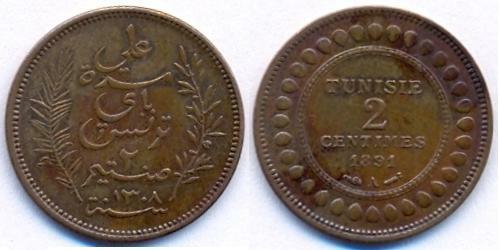 Obverse: Numeral "2" value in Arabic with Date below it in the center. "محمد مدة تونس" (Muhammad Bey of Tunisia) in Arabic in circular form. Reverse: "السلطان الغازي عبد المجيد خان" (al-Sultan al-Ghazi Abdul Majeed Khan) in Arabic from top to bottom. Mintage: N/A. Minted Years: AH1273-1276 (1857-1859). KM#117.2 Piastre. Year: AH 1272 (1856 CE). Weight: 3.20g [3.20g]. Metal: Silver. Diameter: 23.50 mm. Edge: Reeded. Alignment: Medal. Mint: Tunis. Obverse: "محمد مدة تونس" (Muhammad Bey of Tunisia) in the center. "١" (1) and "ت" (T) written above Date. Wreath surrounds the center legends and Date with knot at the bottom. Reverse: "السلطان الغازي عبد المجيد خان" (al-Sultan al-Ghazi Abdul Majeed Khan) in Arabic from top to bottom. Wreath surrounds the center legends and knot at the bottom. Mintage: N/A. Minted Years: One year type. Note: KM#117.1 has thick legend type, produced in AH 1272 and 1273 (1856-1857). Countermarked coinage 1858 [AH 1275]. 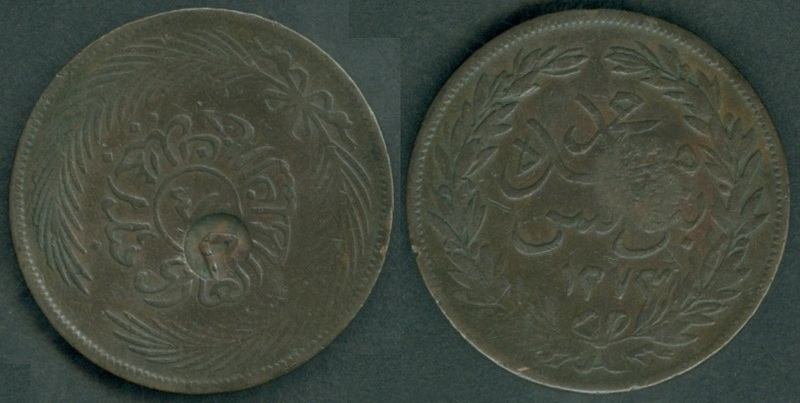 Copper coins produced from AH 1263 to AH 1275 were countermarked with Arabic numeral "1" and "2" in 1858 (AH 1275) during Muhammad ibn al-Husayn Bey (1855-1859) rule. These countermarks were made on Ottoman ruler Abdul Mejid's Tunisia issues (AH1263- 1271) and on his own issues (AH1273-1275). KM#105 1 Khurub. Year: AH1275 (1858) countermarked on AH 1264 (1848 CE). Weight: 11.45g [11.50g]. Metal: Copper. Diameter: 28.50 mm. Edge: Plain. Alignment: Medal. Mint: Tunis. Obverse: countermarked Arabic numeral "1" on the coin. "ضرب في تونس" (Struck at Tunis) in Arabic in the center with Date within circular wreath. Reverse: "السلطان عبد المجيد خان" (al-Sultan Abdul Majid Khan) in Arabic in center circle with four leaves design, surrounded by wreath. Mintage: N/A. Minted Years: countermarked on AH 1263-1271 (1847-1854) issues. Note: Large and small countermarks exist on KM#104.2, 6 Nasri coins minted during AH 1263-1271 (1847-1854). KM#116.2 2 Khurub. Year: AH1275 (1858) countermarked on AH 1273 (1856 CE). Weight: 23.30g [23.00g]. Metal: Copper. Diameter: 33.50 mm. Edge: Plain. Alignment: Medal. Mint: Tunis. Obverse: countermarked Arabic numeral "2" on the coin. "السلطان الغازي عبد المجيد خان" (al-Sultan al-Ghazi Abdul Majeed Khan) in Arabic in circular form around Arabic numeral "13" in the center circle. Circular wreath at the border. Reverse:"محمد مدة تونس" (Muhammad Bey of Tunisia) in Arabic in the center, surrounded by wreath. Mintage: N/A. Minted Years: countermarked on AH 1273-1275 (1856-1858) issues. Note: Countermarks exist on KM#115.2 thick legend, 13 Nasri coins minted during AH 1273-1275 (1856-1858). Muhammad al-Sadiq Bey coinage: 1861 - 1876 [AH 1278-1293] citing Abdul Aziz Khan. KM#153 Quarter Khurub. Year: AH 1281 (1864 CE). Weight: 1.00g [1.00g]. Metal: Copper. Diameter: 14.00 mm. Edge: Plain. Alignment: Medal. Mint: Heaton Mint, Birmingham. Obverse: "ربع" (Quarter) in Arabic written at the top, outside the center circle. "محمد الصادق مدة تونس" (Muhammad al-Sadiq of Tunisia) in Arabic in center circle with Date, surrounded by circular design. Reverse: "السلطان عبد العزيز خان" (al-Sultan Abdul Aziz Khan) in Arabic in center circle, surrounded by wreath. Mintage: 3,200,000. Minted Years: One year type. KM#154 Half Khurub. Year: AH 1281 (1864 CE). Weight: 1.83g [1.80g]. Metal: Copper. Diameter: 18.00 mm. Edge: Plain. Alignment: Medal. Mint: Heaton Mint, Birmingham. Obverse: "نصف" (half) in Arabic written at the top, outside the center circle. "محمد الصادق مدة تونس" (Muhammad al-Sadiq of Tunisia) in Arabic in center circle with Date, surrounded by circular design. Reverse: "السلطان عبد العزيز خان" (al-Sultan Abdul Aziz Khan) in Arabic in center circle, surrounded by wreath. Mintage: 3,200,000. Minted Years: One year type. KM#172 Half Khurub. Year: AH 1289 (1872 CE). Weight: 2.88g [3.20g]. Metal: Copper. Diameter: 24.50 mm. Edge: Plain. Alignment: Medal. Mint: Tunis. Obverse: "محمد الصادق مدة تونس" (Muhammad al-Sadiq of Tunisia) in Arabic in center circle and Date within circular wreath. Reverse: Horizontal line in the center circle. "السلطان عبد العزيز خان" (al-Sultan Abdul Aziz Khan) in Arabic around in circular form, surrounded by wreath. Mintage: N/A. Minted Years: One year type. This coin in my collection is bended. KM#155 One Khurub. Year: AH 1281 (1864 CE). Weight: 3.41g [3.50g]. Metal: Copper. Diameter: 22.00 mm. Edge: Plain. Alignment: Medal. Mint: Heaton Mint, Birmingham. Obverse: Numeral "1" in Arabic written at the top, outside the center circle. "محمد الصادق مدة تونس" (Muhammad al-Sadiq of Tunisia) in Arabic in center circle with Date, surrounded by circular design. Reverse: "السلطان عبد العزيز خان" (al-Sultan Abdul Aziz Khan) in Arabic in center circle, surrounded by wreath. Mintage: 5,600,000. Minted Years: One year type. KM#173 One Khurub. Year: AH 1289 (1872 CE). Weight: 5.92g [6.20g]. Metal: Copper. Diameter: 28.50 mm. Edge: Plain. Alignment: Medal, slightly rotated. Mint: Tunis. Obverse: "محمد الصادق مدة تونس" (Muhammad al-Sadiq of Tunisia) in Arabic in center circle and Date within circular wreath. Reverse: Numeral "1" in Arabic in the center circle. "السلطان عبد العزيز خان" (al-Sultan Abdul Aziz Khan) in Arabic around in circular form, surrounded by wreath. Mintage: N/A. Minted Years: AH 1289 (1872) and AH 1290 (1873). KM#156 Two Khurub. Year: AH 1281 (1864 CE). Weight: 7.46g [7.50g]. Metal: Copper. Diameter: 27.50 mm. Edge: Plain. Alignment: Medal. Mint: Heaton Mint, Birmingham. Obverse: Numeral "2" in Arabic written at the top, outside the center circle. "محمد الصادق مدة تونس" (Muhammad al-Sadiq of Tunisia) in Arabic in center circle with Date, surrounded by circular design. Reverse: "السلطان عبد العزيز خان" (al-Sultan Abdul Aziz Khan) in Arabic in center circle, surrounded by wreath. Mintage: 12,000,000. Minted Years: One year type. Note: Thick and thin planchets exists. KM#174 Two Khurub. Year: AH 1289 (1872 CE). Weight: 11.43g [12.40g]. Metal: Copper. Diameter: 31.50 mm. Edge: Plain. Alignment: Medal. Mint: Tunis. Obverse: "محمد الصادق مدة تونس" (Muhammad al-Sadiq of Tunisia) in Arabic in center circle and Date within circular wreath. Reverse: "السلطان عبد العزيز خان" (al-Sultan Abdul Aziz Khan) in Arabic around in circular form, surrounded by wreath. Numeral "2" in Arabic in the center circle. Mintage: N/A. Minted Years: AH 1289 (1872) and AH 1290 (1873). Type1: Normal Date with thick left leg of 8 in Date. Normal legends. Type2: Obverse: Digit 1 is falling leftwards. Digit 2 is smaller in size and close to above line. Digit 8 is double struck with thick left leg. Digit 9 is touch the above line. 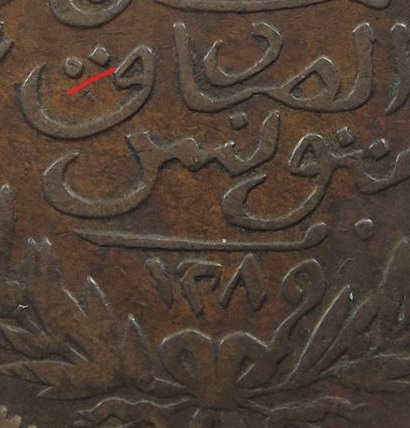 The two diamond dots in Al-Sadiq are straight as above coin (shown with red line). Reverse: There is a thin line (\) below digit 2 in center circle. Weight: 11.92g [12.40g]. Diameter: 31.50 mm. Type3: Obverse: Digit 1 is falling rightwards. Digit 2 is double struck. Digit 8 has thick right leg. Digit 9 is touch the below ribbon knot. The two almost rounded dots in Al-Sadiq are not straight (shown with red line). The dots are more rounded and do not good like diamonds. Reverse: There is a no line below digit 2 in center circle like Type 1. Weight: 11.19g [12.40g]. Diameter: 30.50 mm. This coin is smaller but a but a bit thicker than the above two coins as indicated by the diameter. Type4: Same as Type3 with double "2" in Date but having large diamonds as dot in Arabic legend. Top leaves clearly joining with each other. Diameter slightly larger and Digit 9 in date away from wreath knot. Weight: 11.24g [12.40g]. Diameter: 31.00 mm. Type5: Obverse: Digit 1 is straight. Thick left leg of digit 8. Digit 9 has short tail and without hole. The two diamond dots in Al-Sadiq are straight. Thin wreath ends at the top on both sides. Weight: 11.78g [12.40g]. Diameter: 31.50 mm. Type6: Obverse: Digit 1 is falling leftwards. Thick left leg of digit 8. Digit 9 has short tail. The two diamond dots in Al-Sadiq are straight. Thick wreath ends at the top on both sides. Reverse: Ghost images of legends seen in the back ground. Weight: 11.51g [12.40g]. Diameter: 31.50 mm. Type7: Obverse: Digit 1 is straight. Thick left leg of digit 8. Digit 9 has long tail till wreath ribbon. The two diamond dots in Al-Sadiq are not straight. Thick wreath ends at the top are touching. Weight: 11.31g [12.40g]. Diameter: 31.50 mm. Type8: Same as above Type7, but Digit 1 is straight and thick. Digit 9 has long tail going below wreath ribbon. Weight: 11.94g [12.40g]. Diameter: 31.50 mm. Type9: Same as above Type8, but has Thick right leg of digit 8. Weight: 11.13g [12.40g]. Diameter: 31.50 mm. KM#158 Four Khurub. Year: AH 1281 (1864 CE). Weight: 14.99g [15.00g]. Metal: Copper. Diameter: 31.00 mm. Edge: Plain. Alignment: Medal. Mint: Heaton Mint, Birmingham. Obverse: Numeral "4" in Arabic written at the top, outside the center circle. "محمد الصادق مدة تونس" (Muhammad al-Sadiq of Tunisia) in Arabic in center circle with Date, surrounded by circular design. Reverse: "السلطان عبد العزيز خان" (al-Sultan Abdul Aziz Khan) in Arabic in center circle, surrounded by wreath. Mintage: 12,000,000. Minted Years: AH 1281 (1864) and AH 1283 (1866). KM#159 Eight Khurub. Year: AH 1281 (1864 CE). Weight: 29.83g [30.00g]. Metal: Copper. Diameter: 33.00 mm. Edge: Plain. Alignment: Medal. Mint: Heaton Mint, Birmingham. Obverse: Numeral "8" in Arabic written at the top, outside the center circle. "محمد الصادق مدة تونس" (Muhammad al-Sadiq of Tunisia) in Arabic in center circle with Date, surrounded by circular design. Reverse: "السلطان عبد العزيز خان" (al-Sultan Abdul Aziz Khan) in Arabic in center circle, surrounded by wreath. Mintage: 10,000,000. Minted Years: One year type. KM#145a 1 Piastre. Year: AH 1289 (1872 CE). Weight: 2.94g [3.20g]. Metal: 0.835 Silver. Diameter: 22.50 mm. Edge: Reeded. Alignment: Medal. Mint: Tunis. Obverse: "محمد الصادق مدة تونس" (Muhammad al-Sadiq of Tunisia) in Arabic, Numeral "1" in Arabic in center with Date, surrounded by wreath. Reverse: "السلطان عبد العزيز خان" (al-Sultan Abdul Aziz Khan) in Arabic in center circle, surrounded by wreath. Mintage: N/A. Minted Years: AH 1287-1293. KM#147a 2 Piastres. Year: AH 1290 (1873 CE). Weight: 5.92g [6.40g]. Metal: 0.835 Silver. Diameter: 27.00 mm. Edge: Reeded. Alignment: Medal. Mint: Tunis. Obverse: "محمد الصادق مدة تونس" (Muhammad al-Sadiq of Tunisia) in Arabic, Numeral "2" in Arabic in center with Date, surrounded by wreath. Reverse: "السلطان عبد العزيز خان" (al-Sultan Abdul Aziz Khan) in Arabic in center circle, surrounded by wreath. Mintage: N/A. Minted Years: AH 1287-1293. Countermarked coinage 1878 [AH 1295]. 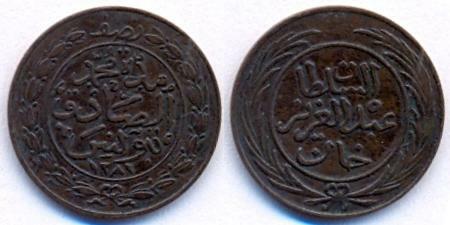 Coins produced from AH 1281 to AH 1295 were countermarked with "star" in 1878 (AH 1295) during Muhammad al-Sadiq Bey (1859-1882) rule on his own issues. KM#168 4 Piastres. Year: AH 1295 (1878) countermarked on AH 1291 (1874) coin. Weight: 11.67g [12.80g]. Metal: 0.835 Silver. Diameter: 31.00 mm. Edge: Reeded. Alignment: Medal. Mint: Tunis. Obverse: "محمد الصادق مدة تونس" (Muhammad al-Sadiq of Tunisia) in Arabic, Numeral "4" in Arabic in center with Date, surrounded by wreath. Reverse: "السلطان عبد العزيز خان" (al-Sultan Abdul Aziz Khan) in Arabic in center circle, surrounded by wreath. Mintage: N/A. Minted Years: countermarked on AH 1290-1293. Note: This coin is countermarked with Star on KM#167 issues. KM#167 mintage years were AH 1288 and AH 1290-1293. 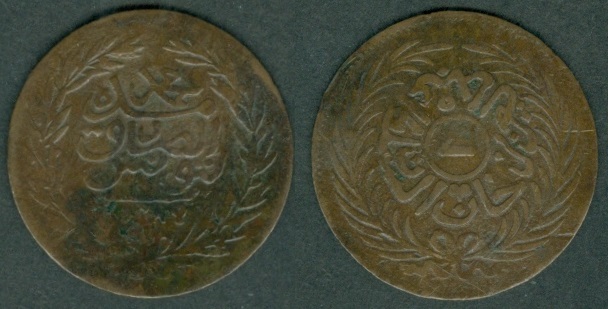 Ali Muddat ibn al-Husayn Bey coinage: 1882 - 1902 under French Protectorate. KM#219 1 centime. Year: 1891 - AH 1308. Weight: 0.97g [1.00g]. Metal: Bronze. Diameter: 15.00 mm. Edge: Plain. Alignment: Coin. Mint: Paris (fasces mint mark). 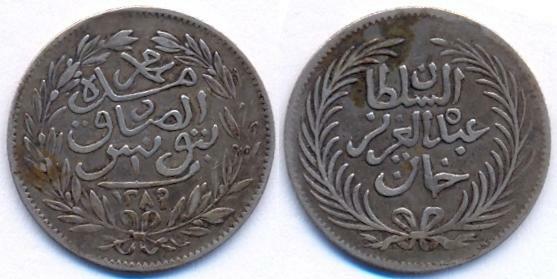 Obverse: "علي مدة باي تونس" (Ali as Bey of Tunisia) in Arabic as first four lines from the top. Numeral "1" value in Arabic. "صنتيم" (centimes) in French-Arabic. Date at the bottom. "سنة" (Year) written in Arabic at bottom. Sprig on both sides. 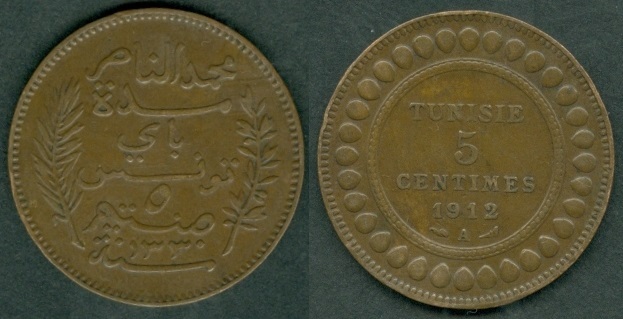 Reverse: "TUNISIE 1 CENTIME" with Date and mint marks at the bottom, all within center circle, surrounded by 32 oval design. Mintage: 500,000. Minted Years: One year type. Engraver: Jean Lagrange (designer of both sides). KM#220 2 centimes. Year: 1891 - AH 1308. Weight: 2.06g [2.00g]. Metal: Bronze. Diameter: 20.00 mm. Edge: Plain. Alignment: Coin. Mint: Paris (fasces mint mark). Obverse: "علي مدة باي تونس" (Ali as Bey of Tunisia) in Arabic as first four lines from the top. Numeral "2" value in Arabic. "صنتيم" (centimes) in French-Arabic. Date at the bottom. "سنة" (Year) written in Arabic at bottom. Sprig on both sides. 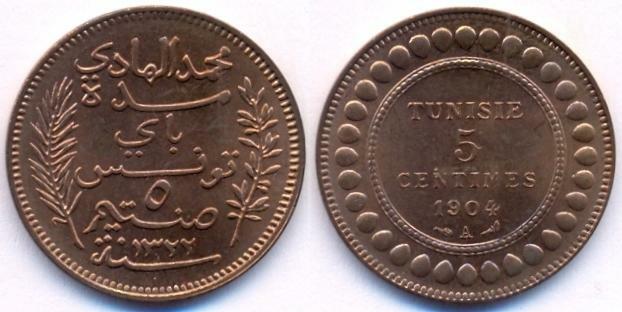 Reverse: "TUNISIE 2 CENTIMES" with Date and mint marks at the bottom, all within center circle, surrounded by 32 oval design. Mintage: 1,000,000. Minted Years: One year type. Engraver: Jean Lagrange (designer of both sides). KM#221 5 centimes. Year: 1891 - AH 1308. Weight: 5.06g [5.00g]. Metal: Bronze. Diameter: 25.00 mm. Edge: Plain. Alignment: Coin. Mint: Paris (fasces mint mark). Obverse: "علي مدة باي تونس" (Ali as Bey of Tunisia) in Arabic as first four lines from the top. Numeral "5" value in Arabic. 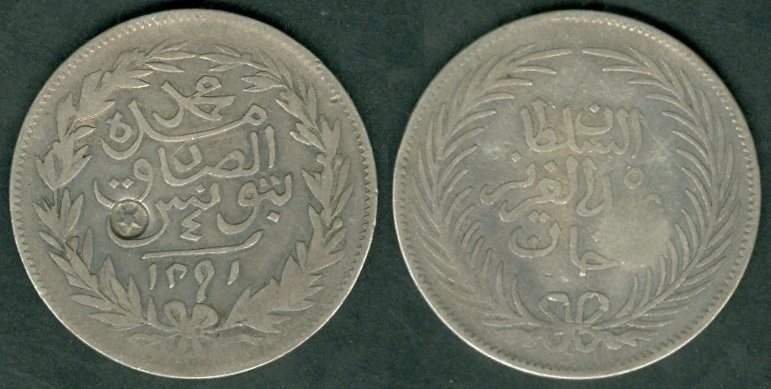 "صنتيم" (centimes) in French-Arabic. Date at the bottom. "سنة" (Year) written in Arabic at bottom. Sprig on both sides. 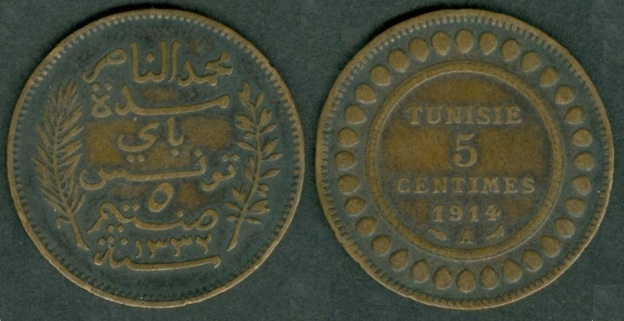 Reverse: "TUNISIE 5 CENTIMES" with Date and mint marks at the bottom, all within center circle, surrounded by 32 oval design. Mintage: 4,300,000. Minted Years: 1891-AH1308, 1892-AH1309 and 1893-AH1310. Engraver: Jean Lagrange (designer of both sides). Same Date as above coin, but the 8 in Date is incomplete making it 1391 instead of 1891. Year: 1892 - AH 1309. Weight: 4.96g [5.00g]. Mintage: 1,192,000. Year: 1893 - AH 1310. Weight: 4.95g [5.00g]. Mintage: 1,008,000. KM#222 10 centimes. Year: 1891 - AH 1308. Weight: 9.86g [10.00g]. Metal: Bronze. Diameter: 30.00 mm. Edge: Plain. Alignment: Coin. Mint: Paris (fasces mint mark). Obverse: "علي مدة باي تونس" (Ali as Bey of Tunisia) in Arabic as first four lines from the top. Numeral "10" value in Arabic. "صنتيم" (centimes) in French-Arabic. Date at the bottom. "سنة" (Year) written in Arabic at bottom. Sprig on both sides. 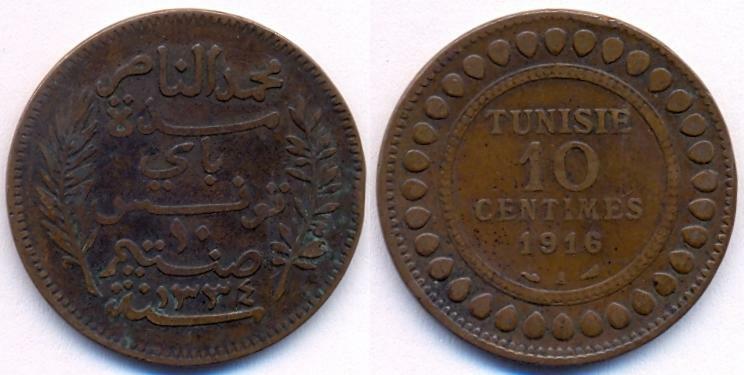 Reverse: "TUNISIE 10 CENTIMES" with Date and mint marks at the bottom, all within center circle, surrounded by 32 oval design. Mintage: 2,600,000. Minted Years: 1891-AH1308, 1892-AH1309, 1892-AH1310 and 1893-AH1310. Engraver: Jean Lagrange (designer of both sides). Year: 1892 - AH 1309. Weight: 10.00g [10.00g]. Mintage: 1,374,000. Year: 1893 - AH 1310. Weight: 10.05g [10.00g]. Mintage: 26,000. KM#223 50 centimes. Year: 1891 - AH 1308. Weight: 2.49g [2.50g]. Metal: 0.835 Silver. Diameter: 18.00 mm. Edge: Reeded. Alignment: Coin. Mint: Paris (fasces mint mark). Obverse: "علي مدة باي تونس" (Muhammad al-Nasir as Bey of Tunisia) in Arabic as first four lines from the top. Numeral "50" value in Arabic. "صنتيم" (centimes) in French-Arabic. Date at the bottom. "سنة" (Year) written in Arabic at bottom. Sprig on both sides. 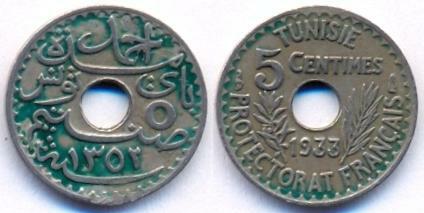 Reverse: "TUNISIE 50 CENTIMES" with Date and mint marks at the bottom, all within center circle, surrounded by design. Mintage: 1,470,000. Minted Years: 1891-AH1308, 1892-AH1309, 1893-AH1310, 1893-AH1311, 1894-AH1311, 1895-AH1313, 1896-AH1314, 1897-AH1315, 1898-AH1316, 1899-AH1317, 1900-AH1318, 1901-AH1319 and 1902-AH1320 (torch mint mark from 1897). Engraver: Jean Lagrange (designer of both sides). KM#224 1 FRANC. Year: 1891 - AH 1308. Weight: 4.90g [5.00g]. Metal: 0.835 Silver. Diameter: 23.00 mm. Edge: Reeded. Alignment: Coin. Mint: Paris (fasces mint mark). Obverse: "علي مدة باي تونس" (Muhammad al-Nasir as Bey of Tunisia) in Arabic as first four lines from the top. Numeral "1" value in Arabic. 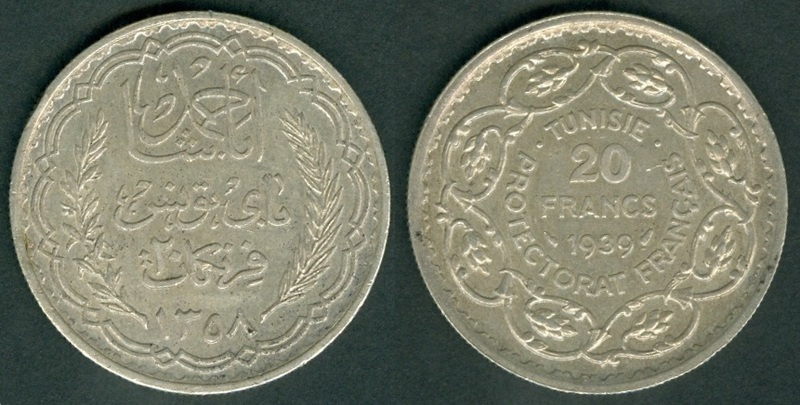 "فرنكـ" (Franc) in French-Arabic. Date at the bottom. "سنة" (Year) written in Arabic at bottom. Sprig on both sides. 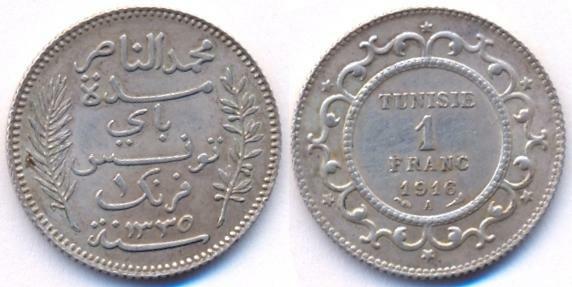 Reverse: "TUNISIE 1 FRANC" with Date and mint marks at the bottom, all within center circle, surrounded by design. Mintage: 1,575,000. Minted Years: 1891-AH1308, 1892-AH1309, 1893-AH1310, 1894-AH1311, 1895-AH1313, 1896-AH1314, 1897-AH1315, 1898-AH1316, 1899-AH1317, 1900-AH1318, 1901-AH1319 and 1902-1320AH (torch mint mark from 1897). Engraver: Jean Lagrange (designer of both sides). Year: 1892 - AH 1309. Weight: 4.99g [5.00g]. Mintage: 1,575,000. KM#225 2 FRANCS. Year: 1892 - AH 1309. Weight: 9.92g [10.00g]. Metal: 0.835 Silver. Diameter: 27.00 mm. Edge: Reeded. Alignment: Coin. Mint: Paris (torch mint mark). Obverse: "علي مدة باي تونس" (Muhammad al-Nasir as Bey of Tunisia) in Arabic as first four lines from the top. Numeral "2" value in Arabic. 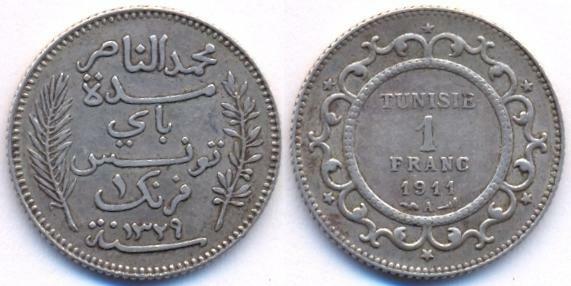 "فرنكـ" (Franc) in French-Arabic. Date at the bottom. "سنة" (Year) written in Arabic at bottom. Sprig on both sides. 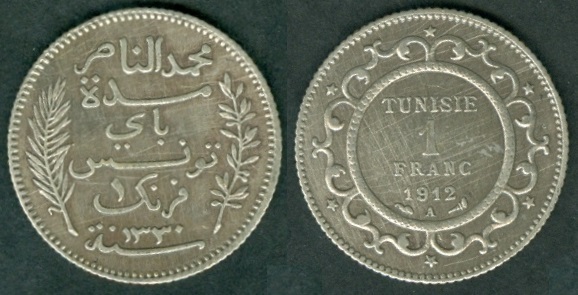 Reverse: "TUNISIE 2 FRANCS" with Date and mint marks at the bottom, all within center circle, surrounded by design. Mintage: 432,146. Minted Years: 1891-AH1308, 1892-AH1309, 1893-AH1310, 1893-AH1311, 1894-AH1311, 1895-AH1313, 1896-AH1314, 1897-AH1315, 1898-AH1316, 1899-AH1317, 1900-AH1318, 1901-AH1319 and 1902-AH1320. Engraver: Jean Lagrange (both sides). KM#227 20 Francs. Year: 1892 - AH 1309. Weight: 6.45g [6.4516g]. Metal: 0.900 Gold. Diameter: 21.00 mm. Edge: Decorated (Crescent and Star 15 times each alternatively). Alignment: Coin. Mint: Paris (fasces mint mark). Obverse: "علي مدة باي تونس" (Ali as Bey of Tunisia) in Arabic as first four lines from the top. Numeral "20" value in Arabic. "فرنكـ" (Franc) in Arabic. Date at the bottom. "سنة" (Year) written in Arabic at bottom. Sprig on both sides. Reverse: Star at the top. 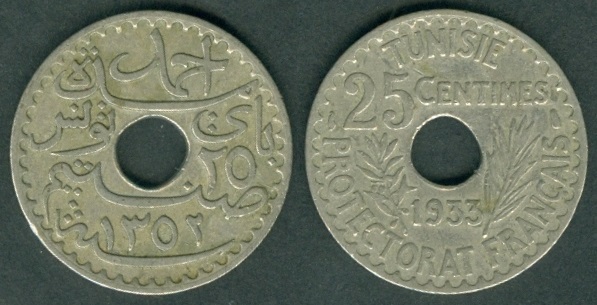 "TUNISIE 20 FRANCS" in the center with Date and mint marks at the bottom, all within center circle, surrounded by design. Mintage: 937,000 (including 1892-AH1310). Minted Years: 1891-AH1308, 1892-AH1309, 1892-AH1310, 1893-AH1310, 1894-AH1311, 1895-AH1313, 1896-AH1314, 1897-AH1315, 1898-AH1316, 1899-AH1316, 1900-AH1318, 1901-AH1319 and 1902-1320AH (torch mint mark from 1897). 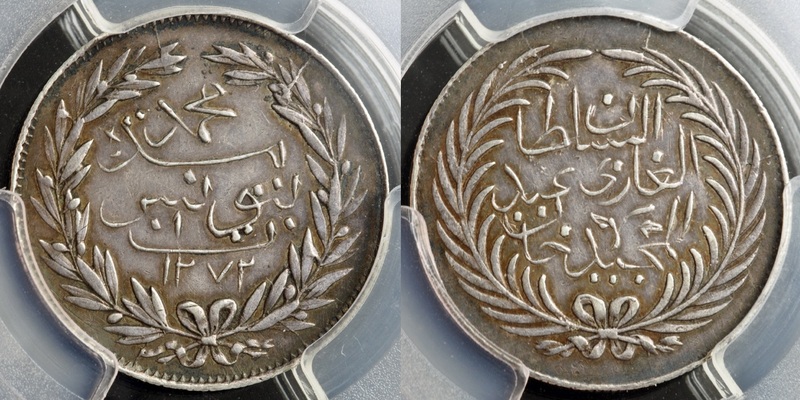 Engraver: Jean Lagrange (designer of both sides)..
Muhammad al-Hadi Bey coinage: 1902 - 1906 under French Protectorate. KM#228 5 centimes. Year: 1903 - AH 1321. Weight: 4.92g [5.00g]. Metal: Bronze. Diameter: 25.00 mm. Edge: Plain. Alignment: Coin. Mint: Paris (torch mint mark). Obverse: "محمد الهادي مدة باي تونس" (Muhammad al-Hadi as Bey of Tunisia) in Arabic as first four lines from the top. Numeral "5" value in Arabic. "صنتيم" (centimes) in French-Arabic. Date at the bottom. "سنة" (Year) written in Arabic at bottom. Sprig on both sides. 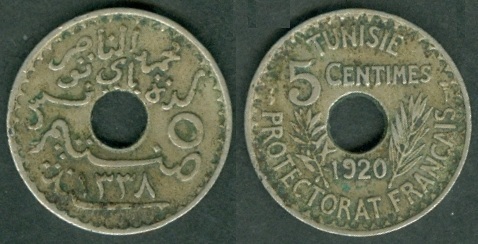 Reverse: "TUNISIE 5 CENTIMES" with Date and mint marks at the bottom, all within center circle, surrounded by 32 oval design. Mintage: 500,000. 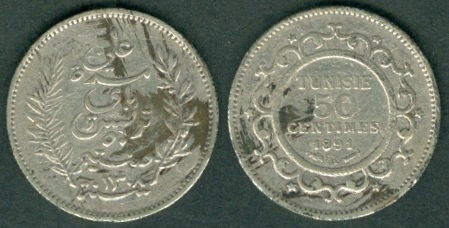 Minted Years: 1903-AH1321 and 1904-AH1322. Engraver: Jean Lagrange (designer of both sides). Year: 1904 - AH 1322. Weight: 5.03g [5.00g]. Mintage: 1,000,000. KM#229 10 centimes. Year: 1903 - AH 1321. Weight: 9.51g [10.00g]. Metal: Bronze. Diameter: 30.00 mm. Edge: Plain. Alignment: Coin. Mint: Paris (torch mint mark). Obverse: "محمد الهادي مدة باي تونس" (Muhammad al-Hadi as Bey of Tunisia) in Arabic as first four lines from the top. Numeral "10" value in Arabic. "صنتيم" (centimes) in French-Arabic. Date at the bottom. "سنة" (Year) written in Arabic at bottom. Sprig on both sides. Reverse: "TUNISIE 10 CENTIMES" with Date and mint marks at the bottom, all within center circle, surrounded by 32 oval design. Mintage: 250,000. Minted Years: 1903-AH1321 and 1904-AH1322. Engraver: Jean Lagrange (designer of both sides). Year: 1904 - AH 1322. Weight: 9.87g [10.00g]. Mintage: 500,000. KM#231 1 FRANC. Year: 1904 - AH 1322. Weight: 4.95g [5.00g]. Metal: 0.835 Silver. Diameter: 23.00 mm. Edge: Reeded. Alignment: Coin. Mint: Paris (fasces mint mark). Obverse: "محمد الهادي مدة باي تونس" (Muhammad al-Hadi as Bey of Tunisia) in Arabic as first four lines from the top. Numeral "1" value in Arabic. 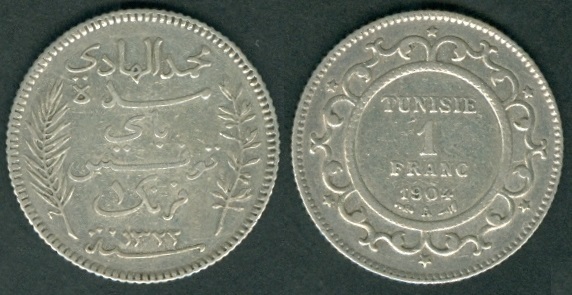 "فرنكـ" (Franc) in French-Arabic. Date at the bottom. "سنة" (Year) written in Arabic at bottom. Sprig on both sides. 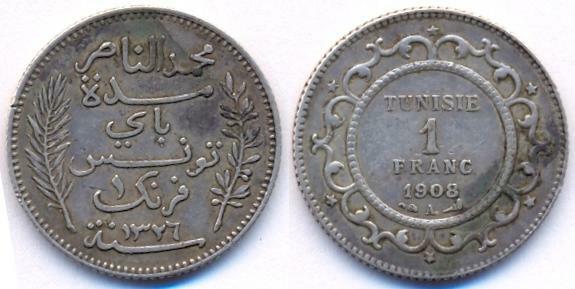 Reverse: "TUNISIE 1 FRANC" with Date and mint marks at the bottom, all within center circle, surrounded by design. Mintage: 300,703. Minted Years: 1903-AH1321, 1904-AH1322, 1905-AH1323 and 1906-AH1324. Engraver: Jean Lagrange (designer of both sides). KM#234 20 Francs. Year: 1904 - AH 1322. Weight: 6.45g [6.4516g]. Metal: 0.900 Gold. Diameter: 21.00 mm. Edge: Decorated (Crescent and Star 15 times each alternatively). Alignment: Coin (torch mint mark). Mint: Paris. Obverse: "محمد الهادي مدة باي تونس" (Muhammad al-Hadi as Bey of Tunisia) in Arabic as first four lines from the top. Numeral "20" value in Arabic. "فرنكـ" (Franc) in Arabic. Date at the bottom. "سنة" (Year) written in Arabic at bottom. Sprig on both sides. Reverse: Star at the top. 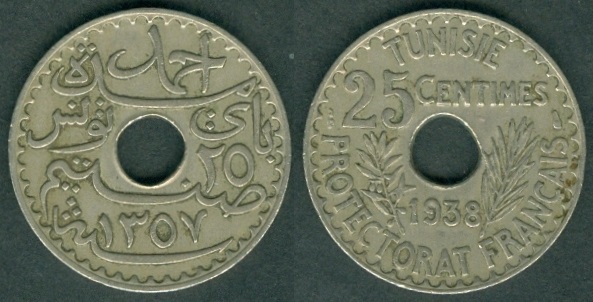 "TUNISIE 20 FRANCS" in the center with Date and mint marks at the bottom, all within center circle, surrounded by design. Mintage: 600,023 (including 1904-AH1321). Minted Years: 1903-AH1321, 1904-AH1321, 1904-AH1322, 1905-AH1323 and 1906-AH1324. Engraver: Jean Lagrange (designer of both sides). 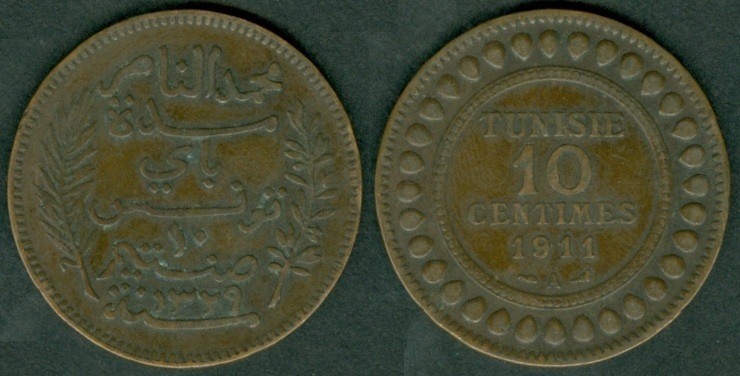 Muhammad al-Nasir Bey coinage: 1907 - 1921 under French Protectorate. KM#235 5 centimes. Year: 1907 - AH 1325. Weight: 5.08g [5.00g]. Metal: Bronze. Diameter: 25.00 mm. Edge: Plain. Alignment: Coin. Mint: Paris (torch mint mark). Obverse: "محمد الناصر مدة باي تونس" (Muhammad al-Nasir as Bey of Tunisia) in Arabic as first four lines from the top. Numeral "5" value in Arabic. "صنتيم" (centimes) in French-Arabic. Date at the bottom. "سنة" (Year) written in Arabic at bottom. Sprig on both sides. 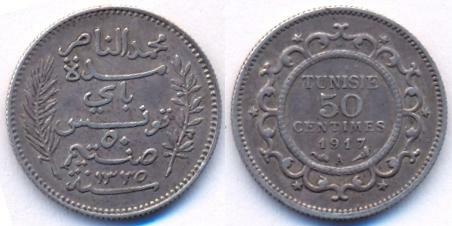 Reverse: "TUNISIE 5 CENTIMES" with Date and mint marks at the bottom, all within center circle, surrounded by 32 oval design. Mintage: 1,000,000. Minted Years: 1907-AH1325, 1908-AH1326, 1912-AH1330, 1914-AH1332, 1916-AH1334 and 1917-AH1336. Engraver: Jean Lagrange (designer of both sides). Year: 1908 - AH 1326. Weight: 5.00g [5.00g]. Mintage: 1,000,000. Year: 1912 - AH 1330. Weight: 4.89g [5.00g]. Mintage: 1,000,000. Year: 1914 - AH 1332. Weight: 4.90g [5.00g]. Mintage: 1,000,000. Year: 1916 - AH 1334. Weight: 5.19g [5.00g]. Mintage: 2,000,000. Year: 1917 - AH 1336. Weight: 5.07g [5.00g]. Mintage: 2,021,000. KM#242 5 centimes. Year: 1918 - AH 1337. Weight: 2.93g [3.00g]. Metal: Nickel-Bronze. Diameter: 19.00 mm. Edge: Plain. Alignment: Coin. Mint: Paris (torch mint mark). Obverse: "محمد الناصر مدة باي تونس" (Muhammad al-Nasir as Bey of Tunisia) in Arabic at the top. Numeral "5" value in Arabic on right side. "صنتيم" (centimes) in French-Arabic below the center hole. Date at the bottom. "سنة" (Year) written in Arabic at bottom. 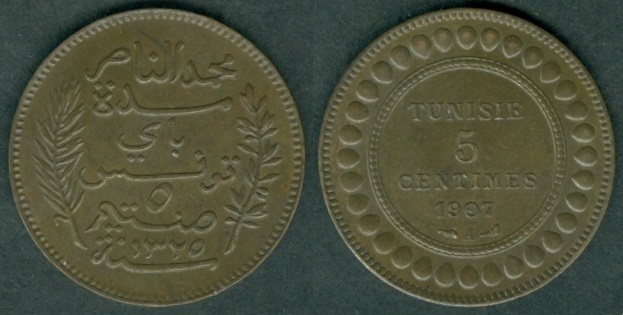 Reverse: "TUNISIE 5 CENTIMES" at the top. Mint marks at both sides. Date below the center hole. Sprig on both sides of the Date. "PROTECTORAT FRANÇAIS" (French Protectorate) at the bottom. Mintage: 1,549,459. Minted Years: 1918-AH1337, 1919-AH1337, 1920-AH1338, 1920-AH1338/6, 1920-AH1338/7 and 1920-AH1339. Engraver: Henri Auguste Jules Patey (designer of both sides). Year: 1919 - AH 1337 (same AH year as above). Weight: 2.98g [3.00g]. Mintage: 4,450,541. 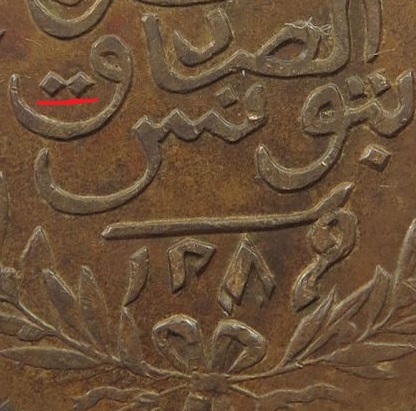 Same Date as above coin, but the Arabic three dots above inner circle are half cut. Year: 1920 - AH 1338. Weight: 2.98g [3.00g]. Mintage: 2,206,406 (including above coin). Year: 1920 - AH 1339. Weight: 2.98g [3.00g]. Mintage: N/A (including above coin). KM#245 5 centimes. Year: 1920 - AH 1339. Weight: 1.93g [2.00g]. Metal: Nickel-Bronze. Diameter: 17.00 mm. Edge: Plain. Alignment: Coin. Mint: Paris (torch mint mark). Obverse: "محمد الناصر مدة باي تونس" (Muhammad al-Nasir as Bey of Tunisia) in Arabic at the top. Numeral "5" value in Arabic on right side. "صنتيم" (centimes) in French-Arabic below the center hole. Date at the bottom. "سنة" (Year) written in Arabic at bottom. 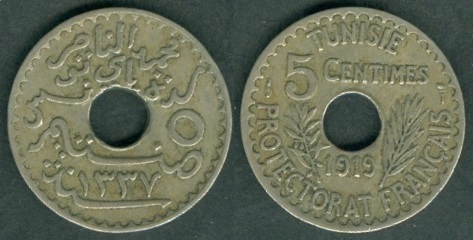 Reverse: "TUNISIE 5 CENTIMES" at the top. Mint marks at both sides. Date below the center hole. Sprig on both sides of the Date. "PROTECTORAT FRANÇAIS" (French Protectorate) at the bottom. Mintage: 1,793,594. Minted Years: One year type. Engraver: Henri Auguste Jules Patey (designer of both sides). Note: Medal alignment also exists. KM#236 10 centimes. Year: 1907 - AH 1325. Weight: 10.06g [10.00g]. Metal: Bronze. Diameter: 30.00 mm. Edge: Plain. Alignment: Coin. Mint: Paris (torch mint mark). Obverse: "محمد الناصر مدة باي تونس" (Muhammad al-Nasir as Bey of Tunisia) in Arabic as first four lines from the top. Numeral "10" value in Arabic. 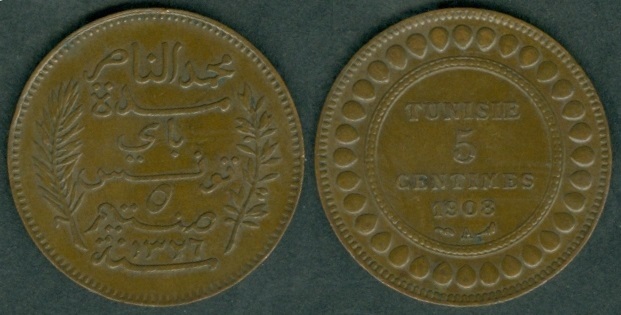 "صنتيم" (centimes) in French-Arabic. Date at the bottom. "سنة" (Year) written in Arabic at bottom. Sprig on both sides. 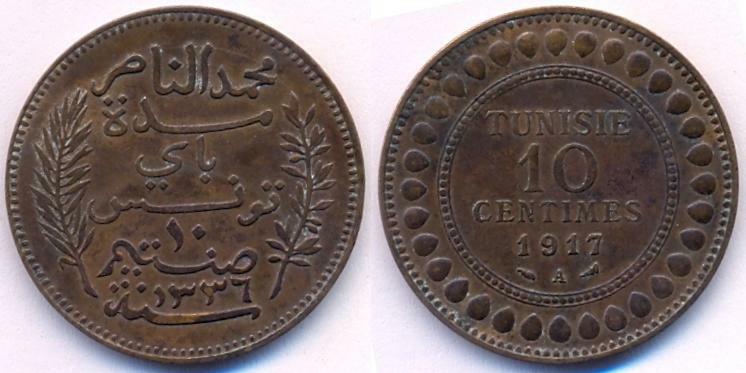 Reverse: "TUNISIE 10 CENTIMES" with Date and mint marks at the bottom, all within center circle, surrounded by 32 oval design. Mintage: 500,003. Minted Years: 1907-AH1325, 1908-AH1326, 1911-AH1329, 1912-AH1330, 1914-AH1332, 1916-AH1334 and 1917-AH1336. Engraver: Jean Lagrange (designer of both sides). Year: 1908 - AH 1326. Weight: 9.75g [10.00g]. Mintage: 500,000. Year: 1911 - AH 1329. Weight: 9.80g [10.00g]. Mintage: 500,000. Year: 1912 - AH 1330. Weight: 9.95g [10.00g]. Mintage: 500,000. Year: 1914 - AH 1332. Weight: 10.04g [10.00g]. Mintage: 500,000. Year: 1916 - AH 1334. Weight: 9.51g [10.00g]. Mintage: 1,000,000. Year: 1917 - AH 1336. Weight: 10.14g [10.00g]. Mintage: 1,050,195. KM#243 10 centimes. Year: 1918 - AH 1337. Weight: 3.92g [4.00g]. Metal: Nickel-Bronze. Diameter: 21.00 mm. Edge: Plain. Alignment: Coin. Mint: Paris (torch mint mark). Obverse: "محمد الناصر مدة باي تونس" (Muhammad al-Nasir as Bey of Tunisia) in Arabic at the top. Numeral "10" value in Arabic on right side. "صنتيم" (centimes) in French-Arabic below the center hole. Date at the bottom. 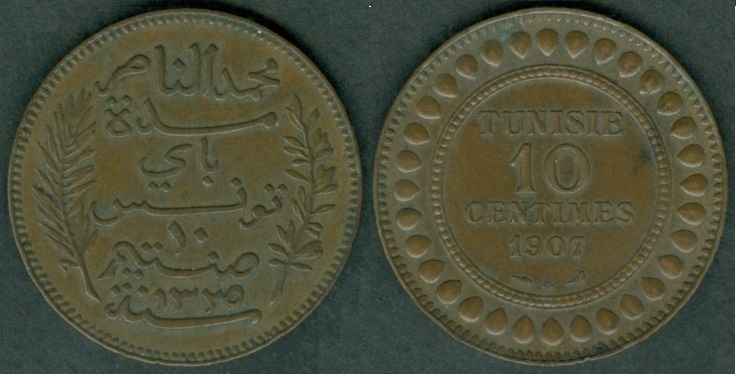 Reverse: "TUNISIE 10 CENTIMES" at the top. Mint marks at both sides. Date below the center hole. "سنة" (Year) written in Arabic at bottom. Sprig on both sides of the Date. "PROTECTORAT FRANÇAIS" (French Protectorate) at the bottom. Mintage: 1,288,000. Minted Years: 1918-AH1337, 1919-AH1337 and 1920-AH1338. Engraver: Henri Auguste Jules Patey (designer of both sides). Year: 1919 - AH 1337. Weight: 3.80g [4.00g]. Mintage: 2,712,000. Year: 1920 - AH 1338. Weight: 3.94g [4.00g]. Mintage: 3,000,000. KM#244 25 centimes. Year: 1918 - AH 1337. Weight: 4.98g [5.00g]. Metal: Nickel-Bronze. Diameter: 24.00 mm. Edge: Plain. Alignment: Coin. Mint: Paris (torch mint mark). Obverse: "محمد الناصر مدة باي تونس" (Muhammad al-Nasir as Bey of Tunisia) in Arabic at the top. Numeral "25" value in Arabic on right side. "صنتيم" (centimes) in French-Arabic below the center hole. Date at the bottom. "سنة" (Year) written in Arabic at bottom. 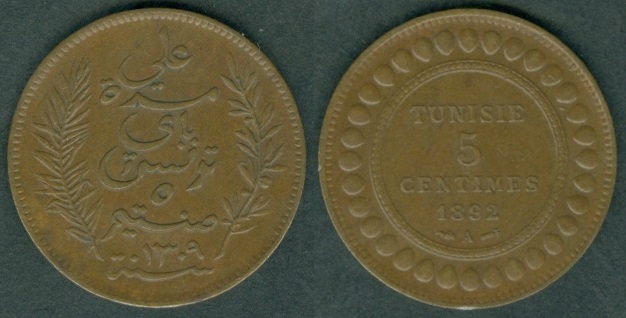 Reverse: "TUNISIE 25 CENTIMES" at the top. Mint marks at both sides. Date below the center hole. Sprig on both sides of the Date. "PROTECTORAT FRANÇAIS" (French Protectorate) at the bottom. Mintage: 2,000,000 (including 1919-AH1337 issue). Minted Years: 1918-AH1337, 1919-AH1337 and 1920-AH1338. Engraver: Henri Auguste Jules Patey (designer of both sides). Year: 1919 - AH 1337. Weight: 4.95g [5.00g]. Mintage: N/A (including above coin). Note: Center hole is not properly cut. Year: 1920 - AH 1338. Weight: 4.90g [5.00g]. Mintage: 2,000,000. KM#237 50 centimes. Year: 1915 - AH 1334. Weight: 2.51g [2.50g]. Metal: 0.835 Silver. Diameter: 18.00 mm. Edge: Reeded. Alignment: Coin. Mint: Paris (torch mint mark). Obverse: "محمد الناصر مدة باي تونس" (Muhammad al-Nasir as Bey of Tunisia) in Arabic as first four lines from the top. Numeral "50" value in Arabic. "صنتيم" (centimes) in French-Arabic. Date at the bottom. "سنة" (Year) written in Arabic at bottom. Sprig on both sides. 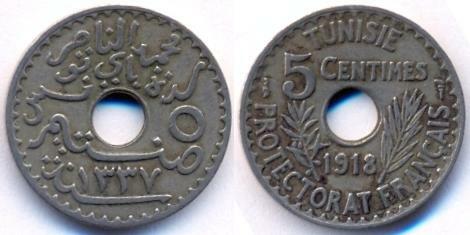 Reverse: "TUNISIE 50 CENTIMES" with Date and mint marks at the bottom, all within center circle, surrounded by design. Mintage: 707,177. Minted Years: 1907-AH1325, 1908-AH1326, 1909-AH1327, 1910-AH1328, 1911-AH1329, 1912-AH1330, 1913-AH1331, 1914-AH1332, 1915-AH1334, 1916-AH1334, 1916-AH1335, 1917-AH1335, 1917-AH1336, 1918-AH1337, 1919-AH1338, 1920-AH1339 and 1921-AH1340. Engraver: Jean Lagrange (both sides). Year: 1916 - AH 1335. Weight: 2.52g [2.50g]. Mintage: 3,613,799 (including 1916 - AH1334 issue). Year: 1917 - AH 1335. Weight: 2.52g [2.50g]. Mintage: 2,139,191. KM#238 1 FRANC. Year: 1907 - AH 1325. Weight: 5.00g [5.00g]. Metal: 0.835 Silver. Diameter: 23.00 mm. Edge: Reeded. Alignment: Coin. Mint: Paris (torch mint mark). Obverse: "محمد الناصر مدة باي تونس" (Muhammad al-Nasir as Bey of Tunisia) in Arabic as first four lines from the top. Numeral "1" value in Arabic. 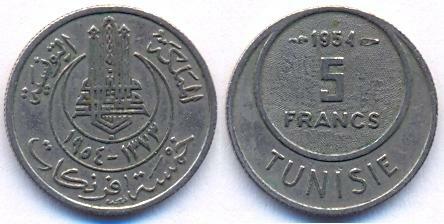 "فرنكـ" (Franc) in French-Arabic. Date at the bottom. Sprig on both sides. 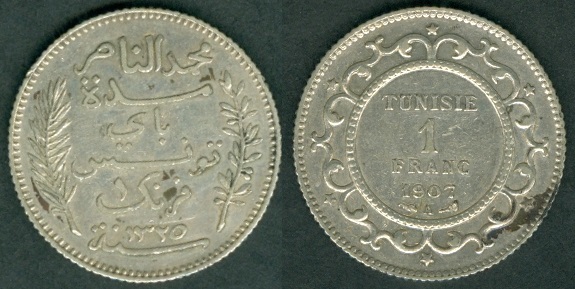 Reverse: "TUNISIE 1 FRANC" with Date and mint marks at the bottom, all within center circle, surrounded by design. Mintage: 300,706. Minted Years: 1907-AH1325, 1908-AH1326, 1909-AH1327, 1910-AH1328, 1911-AH1329, 1912-AH1330, 1913-AH1331, 1914-AH1332, 1914-AH1333, 1915-AH1334, 1916-AH1334, 1916-AH1335, 1917-AH1335, 1918-AH1336, 1918-AH1337, 1919-AH1338, 1920-AH1339 and 1921-AH1340. Engraver: Jean Lagrange (both sides). Year: 1908 - AH 1326. Weight: 4.96g [5.00g]. Mintage: 400,703. Year: 1911 - AH 1329. Weight: 4.98g [5.00g]. Mintage: 105,106. Year: 1912 - AH 1330. Weight: 4.97g [5.00g]. Mintage: 500,703. Year: 1915 - AH 1334. Weight: 4.99g [5.00g]. Mintage: 1,060,193. Year: 1916 - AH 1334. Weight: 4.98g [5.00g]. Mintage: 3,270,083 (including below coin dated 1916-AH1335). Year: 1916 - AH 1335. Weight: 5.03g [5.00g]. KM#239 2 FRANCS. Year: 1908 - AH 1326. Weight: 9.96g [10.00g]. Metal: 0.835 Silver. Diameter: 27.00 mm. Edge: Reeded. Alignment: Coin. Mint: Paris (torch mint mark). Obverse: "محمد الناصر مدة باي تونس" (Muhammad al-Nasir as Bey of Tunisia) in Arabic as first four lines from the top. Numeral "2" value in Arabic. 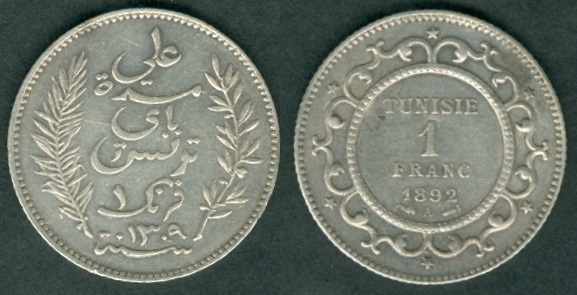 "فرنكـ" (Franc) in French-Arabic. Date at the bottom. "سنة" (Year) written in Arabic at bottom. Sprig on both sides. Reverse: "TUNISIE 2 FRANCS" with Date and mint marks at the bottom, all within center circle, surrounded by design. Mintage: 100,303. Minted Years: 1907-AH1325, 1908-AH1326, 1909-AH1327, 1910-AH1328, 1911-AH1329, 1912-AH1330, 1913-AH1331, 1914-AH1332, 1914-AH1333, 1915-AH1334, 1916-AH1334, 1916-AH1335, 1917-AH1336, 1918-AH1337, 1919-AH1338, 1920-AH1339 and 1921-AH1340. Engraver: Jean Lagrange (both sides). Year: 1914 - AH 1332. Weight: 9.93g [10.00g]. Mintage: 100,303 (including 1914-AH1333 issue). Year: 1915 - AH 1334. Weight: 9.96g [10.00g]. Mintage: 408,171. Year: 1916 - AH 1334. Weight: 10.01g [10.00g]. Mintage: 1,000,303. Muhammad al-Habib Bey coinage: 1922 - 1928 under French Protectorate. KM#254 10 centimes. Year: 1926 - AH 1345. Weight: 3.85g [4.00g]. Metal: Nickel-Bronze. Diameter: 21.00 mm. Edge: Plain. Alignment: Coin. Mint: Paris (torch mint mark). 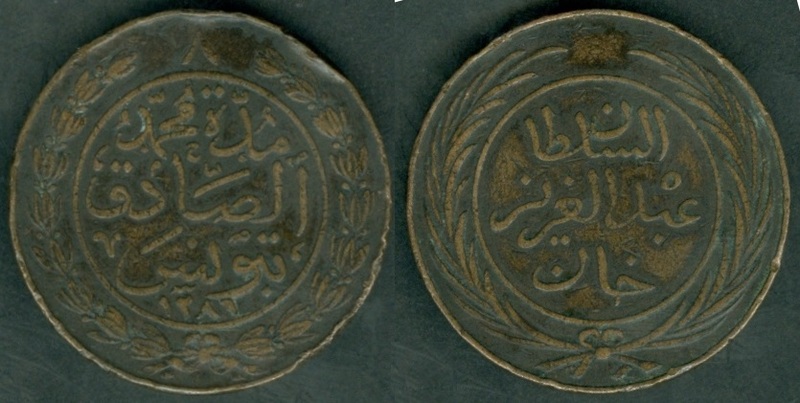 Obverse: "محمد الحبيب مدة باي تونس" (Muhammad al-Habib as Bey of Tunisia) in Arabic at the top. Numeral "10" value in Arabic on right side. "صنتيم" (centimes) in French-Arabic below the center hole. Date at the bottom. 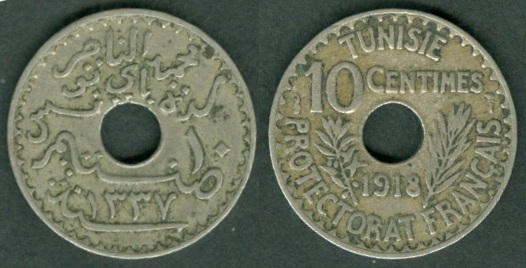 Reverse: "TUNISIE 10 CENTIMES" at the top. Mint marks at both sides. Date below the center hole. "سنة" (Year) written in Arabic at bottom. Sprig on both sides of the Date. "PROTECTORAT FRANÇAIS" (French Protectorate) at the bottom. Mintage: 1,000,000. Minted Years: One year type. Engraver: Henri Auguste Jules Patey (designer of both sides). 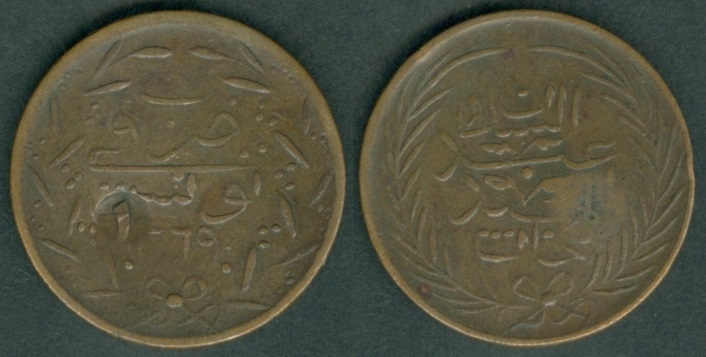 Ahmad II ibn Ali Pasha coinage: 1930 - 1942 under French Protectorate. KM#258 5 centimes. Year: 1931 - AH 1350. Weight: 1.90g [2.00g]. Metal: Nickel-Bronze. Diameter: 17.00 mm. Edge: Plain. Alignment: Coin. Mint: Paris (wing mint mark). Obverse: "احمد مدة باي تونس" (Ahmad as Bey of Tunisia) in Arabic at the top. Numeral "5" value in Arabic on right side. "صنتيم" (centimes) in French-Arabic below the center hole. Date at the bottom. 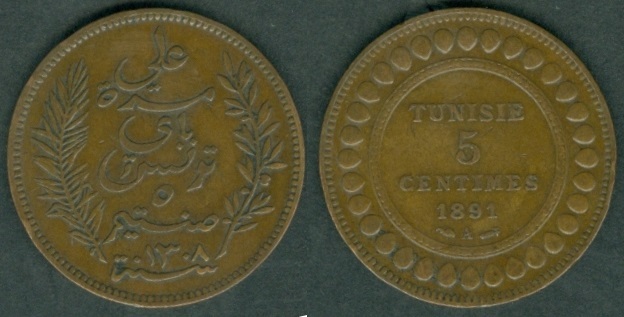 Reverse: "TUNISIE 5 CENTIMES" at the top. Mint marks at both sides. Date below the center hole. "سنة" (Year) written in Arabic at bottom. Sprig on both sides of the Date. "PROTECTORAT FRANÇAIS" (French Protectorate) at the bottom. Mintage: 2,000,000. Minted Years: 1931-AH1350, 1933-AH1352 and 1938-AH1357. Engraver: Henri Auguste Jules Patey (designer of both sides). Year: 1933 - AH 1352. Weight: 1.95g [2.00g]. Mintage: 1,000,000. Year: 1938 - AH 1357. Weight: 1.98g [2.00g]. Mintage: 1,200,000. KM#259 10 centimes. Year: 1931 - AH 1350. Weight: 3.92g [4.00g]. Metal: Nickel-Bronze. Diameter: 21.00 mm. Edge: Plain. Alignment: Coin. Mint: Paris (wing mint mark). Obverse: "احمد مدة باي تونس" (Ahmad as Bey of Tunisia) in Arabic at the top. Numeral "10" value in Arabic on right side. "صنتيم" (centimes) in French-Arabic below the center hole. Date at the bottom. 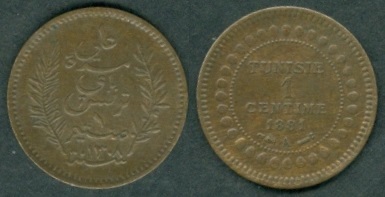 Reverse: "TUNISIE 10 CENTIMES" at the top. Mint marks at both sides. Date below the center hole. "سنة" (Year) written in Arabic at bottom. Sprig on both sides of the Date. "PROTECTORAT FRANÇAIS" (French Protectorate) at the bottom. Mintage: 750,000. Minted Years: 1931-AH1350, 1933-AH1352 and 1938-AH1357. Engraver: Henri Auguste Jules Patey (designer of both sides). Year: 1933 - AH 1352. Weight: 3.99g [4.00g]. Mintage: 1,000,000. Note: Wide and narrow exists for this coin. Year: 1938 - AH 1357. Weight: 4.05g [4.00g]. Mintage: 1,200,000. KM#267 10 centimes. Year: 1941 - AH 1360. Weight: 2.55g [2.50g]. Metal: Zinc. Diameter: 21.00 mm. Edge: Reeded. Alignment: Coin. Mint: Paris (wing mint mark). Obverse: "احمد مدة باي تونس" (Ahmad as Bey of Tunisia) in Arabic at the top. Numeral "10" value in Arabic on right side. "صنتيم" (centimes) in French-Arabic below the center hole. Date at the bottom. 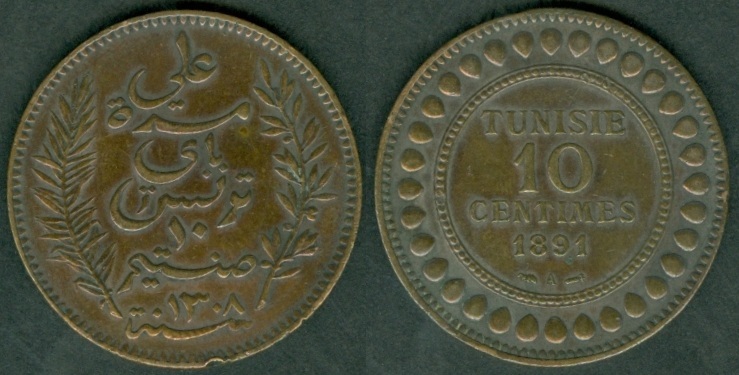 Reverse: "TUNISIE 10 CENTIMES" at the top. Mint marks at both sides. Date below the center hole. "سنة" (Year) written in Arabic at bottom. Sprig on both sides of the Date. "PROTECTORAT FRANÇAIS" (French Protectorate) at the bottom. Mintage: 5,000,000. Minted Years: 1941-AH1360 and 1942-AH1361. Engraver: Lucien Georges Bazor (designer of both sides). Year: 1942 - AH 1361. Weight: 2.61g [2.50g]. Mintage: 10,000,000. KM#268 20 centimes. Year: 1942 - AH 1361. Weight: 3.53g [3.60g]. Metal: Zinc. Diameter: 24.00 mm. Edge: Reeded. Alignment: Coin. Mint: Paris (wing mint mark). Obverse: "احمد مدة باي تونس" (Ahmad as Bey of Tunisia) in Arabic at the top. Numeral "20" value in Arabic on right side. "صنتيم" (centimes) in French-Arabic below the center hole. Date at the bottom. 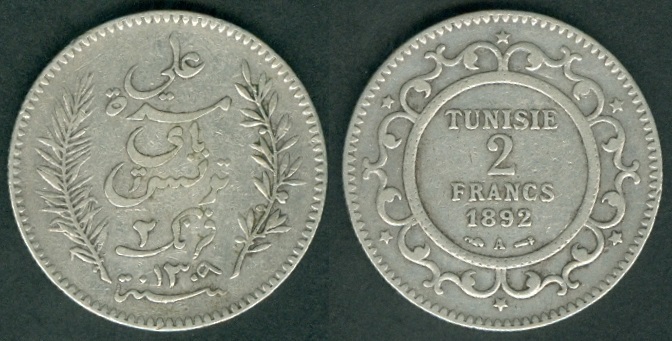 Reverse: "TUNISIE 20 CENTIMES" at the top. Mint marks at both sides. Date below the center hole. "سنة" (Year) written in Arabic at bottom. Sprig on both sides of the Date. "PROTECTORAT FRANÇAIS" (French Protectorate) at the bottom. Mintage: 5,000,000. Minted Years: One year type. Engraver: Lucien Georges Bazor (designer of both sides). KM#260 25 centimes. Year: 1931 - AH 1350. Weight: 5.07g [5.00g]. Metal: Nickel-Aluminum-Bronze. Diameter: 24.00 mm. Edge: Plain. Alignment: Coin. Mint: Paris (wing mint mark). Obverse: "احمد مدة باي تونس" (Ahmad as Bey of Tunisia) in Arabic at the top. Numeral "25" value in Arabic on right side. "صنتيم" (centimes) in French-Arabic below the center hole. Date at the bottom. 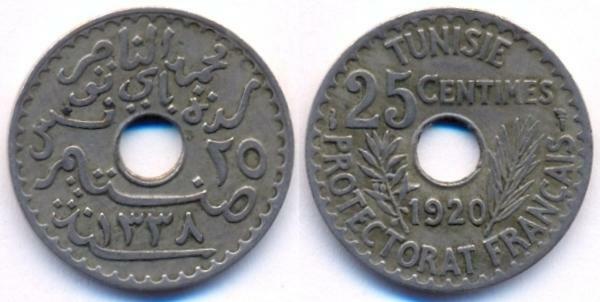 Reverse: "TUNISIE 25 CENTIMES" at the top. Mint marks at both sides. Date below the center hole. "سنة" (Year) written in Arabic at bottom. Sprig on both sides of the Date. "PROTECTORAT FRANÇAIS" (French Protectorate) at the bottom. Mintage: 300,000. Minted Years: 1931-AH1350, 1933-AH1352 and 1938-AH1357. Engraver: Henri Auguste Jules Patey (designer of both sides). Year: 1933 - AH 1352. Weight: 4.94g [5.00g]. Mintage: 400,000. Year: 1938 - AH 1357. Weight: 4.92g [5.00g]. Mintage: 480,000. Note: Digit "8" in date "1938" is slightly down from the rest of the digits. KM#261 5 Francs. Year: AH 1353 (1935 CE). Weight: 4.97g [5.00g]. Metal: 0.680 Silver. Diameter: 23.50 mm. Edge: Reeded. Alignment: Coin. Mint: Paris (wing mint mark). 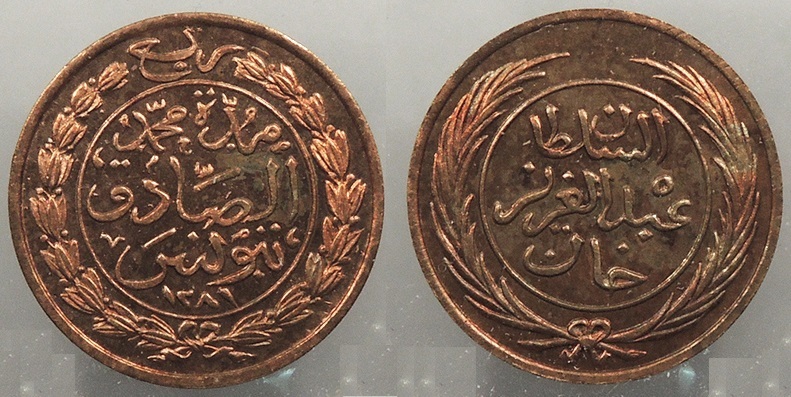 Obverse: "أحمد باشا باي تونس" (Ahmad Pasha Bey of Tunisia) in Arabic as first two lines from the top. 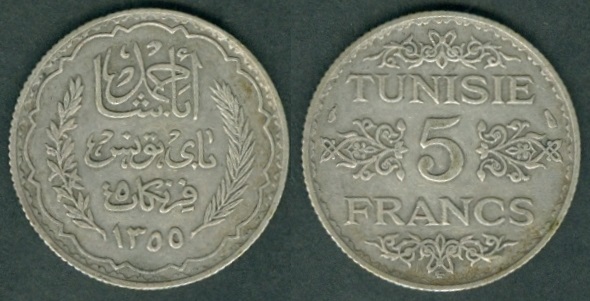 Numeral "5" value in Arabic with "فرنكات" (Francs). Date at the bottom. 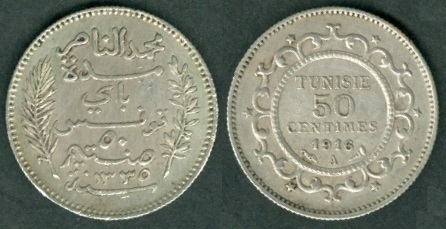 Reverse: "TUNISIE 5 FRANCS" in the center. Mint marks at both sides. Design on all four sides. Mintage: 2,000,000. Minted Years: AH1353 (1934) and AH1355 (1936). Engraver: Lucien Georges Bazor (designer of both sides). Year: AH 1355 (1936). Weight: 5.03g [5.00g]. Mintage: 2,000,000. KM#264 5 Francs. Year: AH 1358 - 1939. Weight: 4.96g [5.00g]. Metal: 0.680 Silver. Diameter: 23.50 mm. Edge: Reeded. Alignment: Coin. Mint: Paris (wing mint mark). 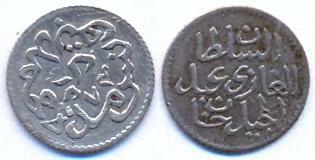 Obverse: "أحمد باشا باي تونس" (Ahmad Pasha Bey of Tunisia) in Arabic as first two lines from the top. 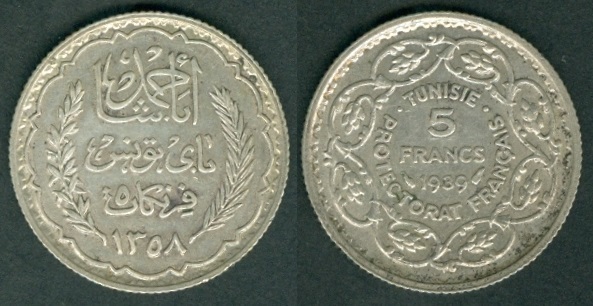 Numeral "5" value in Arabic with "فرنكات" (Francs). Date at the bottom. 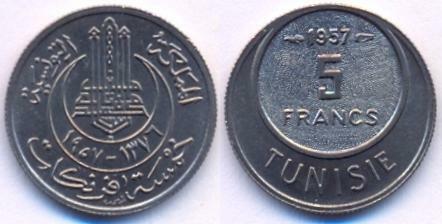 Reverse: "TUNISIE 5 FRANCS" in the center. 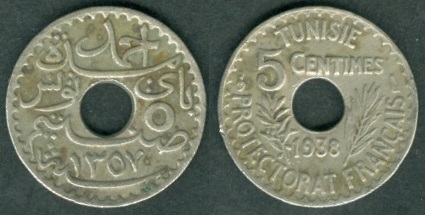 Mint marks at both sides of the Date. "PROTECTORAT FRANÇAIS" (French Protectorate) below the Date. All these are in circular form surrounded by circular design. Mintage: 1,600,000. Minted Years: One year type. Engraver: Lucien Georges Bazor (designer of both sides). KM#262 10 Francs. Year: AH 1353 (1935 CE). Weight: 9.97g [10.00g]. Metal: 0.680 Silver. Diameter: 27.50 mm. Edge: Reeded. Alignment: Coin. Mint: Paris (wing mint mark). 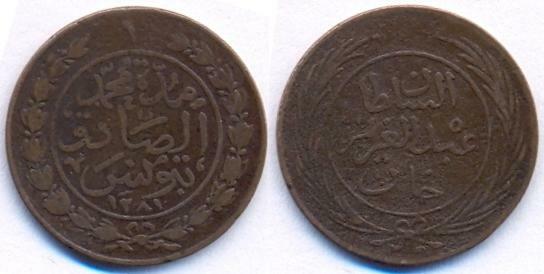 Obverse: "أحمد باشا باي تونس" (Ahmad Pasha Bey of Tunisia) in Arabic as first two lines from the top. 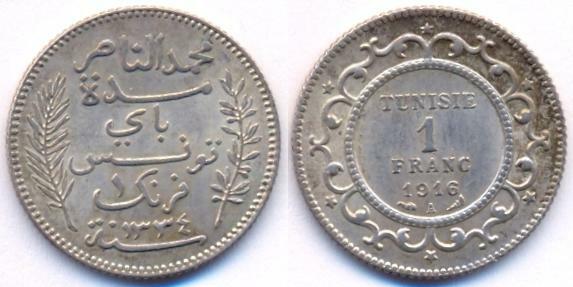 Numeral "10" value in Arabic with "فرنكات" (Francs). Date at the bottom. 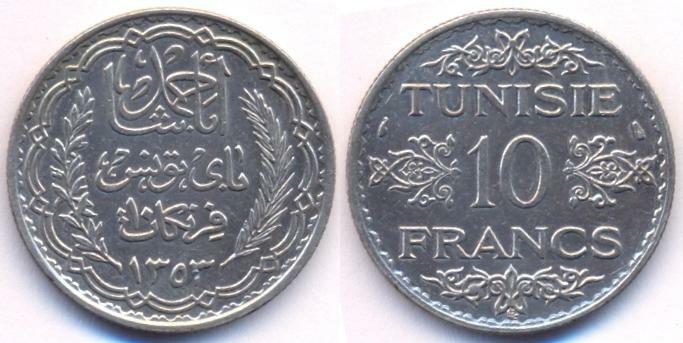 Reverse: "TUNISIE 10 FRANCS" in the center. Mint marks at both sides. Design on all four sides. Mintage: 1,500,000 + 1,103 Proofs. Minted Years: AH1353 - 1358 (1935-1939) [AH1357 and AH1358 issues are not having Paris mint marks]. Engraver: Edmond-Emile Lindauer (designer of both sides). KM#265 10 Francs. Year: 1939 - AH 1358. Weight: 9.97g [10.00g]. Metal: 0.680 Silver. Diameter: 27.50 mm. Edge: Reeded. Alignment: Coin. Mint: Paris (wing mint mark). Obverse: "أحمد باشا باي تونس" (Ahmad Pasha Bey of Tunisia) in Arabic as first two lines from the top. 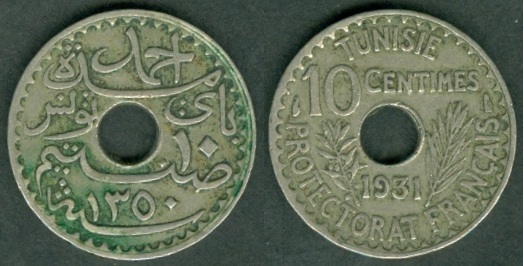 Numeral "10" value in Arabic with "فرنكات" (Francs). Date at the bottom. 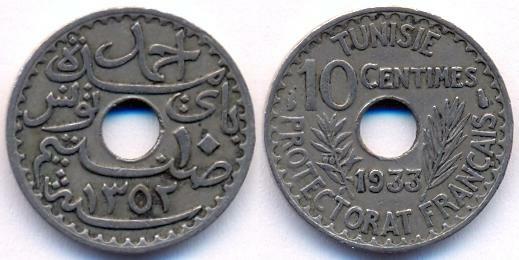 Reverse: "TUNISIE 10 FRANCS" in the center. 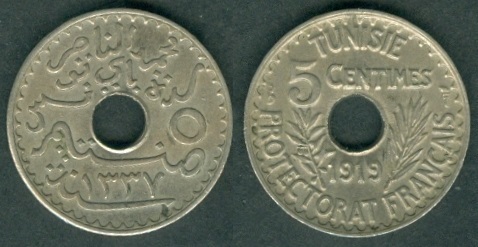 Mint marks at both sides of the Date. "PROTECTORAT FRANÇAIS" (French Protectorate) below the Date. All these are in circular form surrounded by circular design. Mintage: 501,000. Minted Years: 1939-AH1358, 1940-AH1359, 1941-AH1360 and 1942-AH1361. Engraver: Lucien Georges Bazor (designer of both sides). KM#263 20 Francs. Year: AH 1353 (1935 CE). Weight: 19.96g [20.00g]. Metal: 0.680 Silver. Diameter: 34.50 mm. Edge: Reeded. Alignment: Coin. Mint: Paris (wing mint mark). 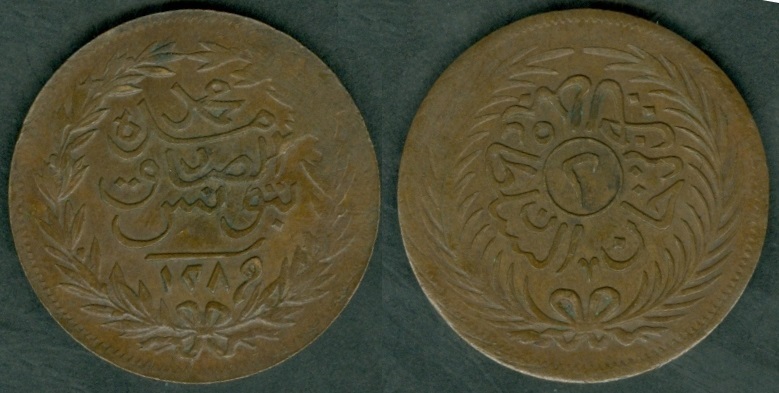 Obverse: "أحمد باشا باي تونس" (Ahmad Pasha Bey of Tunisia) in Arabic as first two lines from the top. 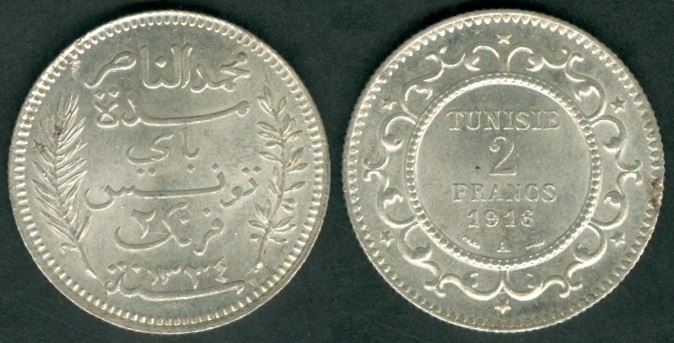 Numeral "20" value in Arabic with "فرنكات" (Francs). Date at the bottom. 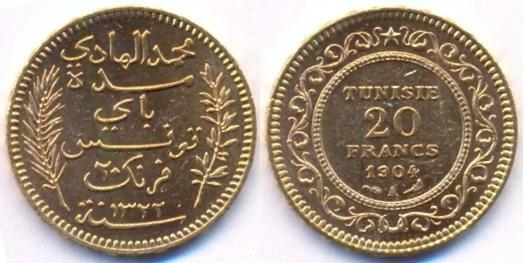 Reverse: "TUNISIE 20 FRANCS" in the center. Mint marks at both sides. Design on all four sides. Mintage: 1,250,000. Minted Years: 1353 (1934), 1354 (1935), 1355 (1936) and 1356 (1937). Engraver: Edmond-Emile Lindauer (designer of both sides). KM#266 20 Francs. Year: 1939 - AH 1358. Weight: 19.98g [20.00g]. Metal: 0.680 Silver. Diameter: 34.50 mm. Edge: Reeded. Alignment: Coin. Mint: Paris (wing mint mark). 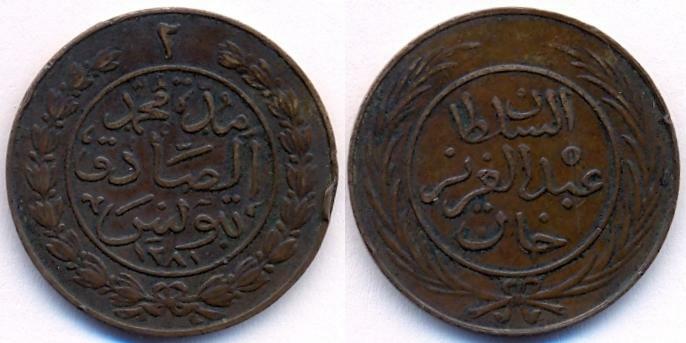 Obverse: "أحمد باشا باي تونس" (Ahmad Pasha Bey of Tunisia) in Arabic as first two lines from the top. 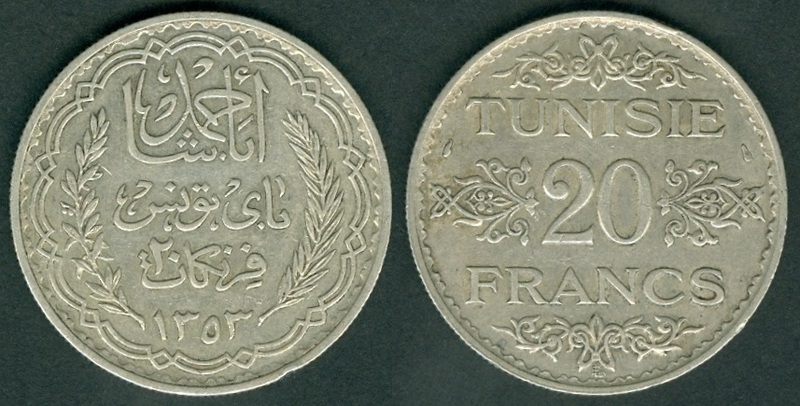 Numeral "20" value in Arabic with "فرنكات" (Francs). Date at the bottom. 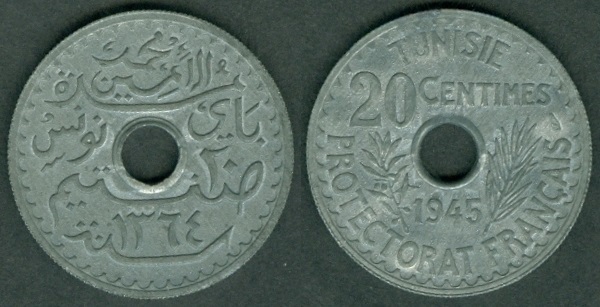 Reverse: "TUNISIE 20 FRANCS" in the center. 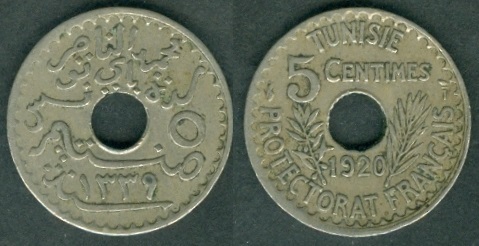 Mint marks at both sides of the Date. "PROTECTORAT FRANÇAIS" (French Protectorate) below the Date. All these are in circular form surrounded by circular design. Mintage: 100,000. Minted Years: 1939-AH1358, 1940-AH1359 (require confirmation), 1941-AH1360 and 1942-AH1361. Engraver: Lucien Georges Bazor (designer of both sides). 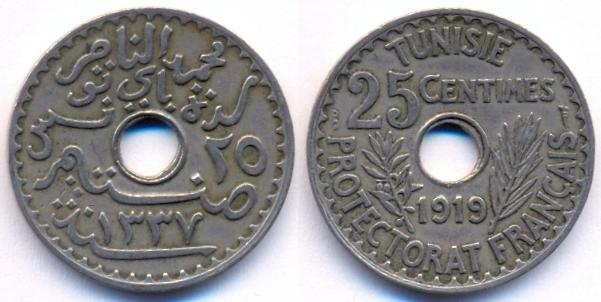 Muhammad Al-Amin Bey coinage: 1943 - 1954 under French Protectorate (Kingdom coins from 1950). KM#272 20 centimes. Year: 1945 - AH 1364. Weight: 3.10g [3.50g]. Metal: Zinc. Diameter: 24.00 mm. Edge: Reeded. Alignment: Coin. Mint: Paris (wing mint mark). Obverse: "محمد الأمين مدة باي تونس" (Muhammad al-Amin as Bey of Tunisia) in Arabic at the top. Numeral "20" value in Arabic on right side. "صنتيم" (centimes) in French-Arabic below the center hole. Date at the bottom. 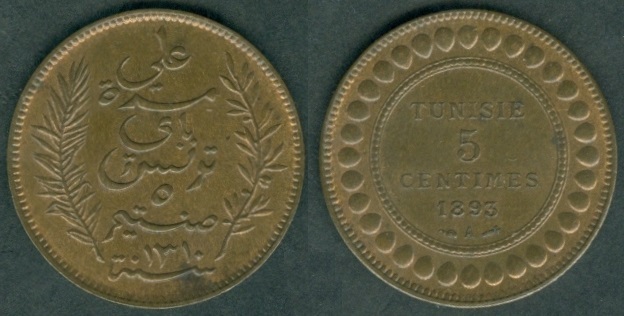 Reverse: "TUNISIE 20 CENTIMES" at the top. Mint marks at both sides. Date below the center hole. "سنة" (Year) written in Arabic at bottom. Sprig on both sides of the Date. "PROTECTORAT FRANÇAIS" (French Protectorate) at the bottom. Mintage: 5,205,000 (most of them were melted). Minted Years: One year type. Engraver: Lucien Georges Bazor (designer of both sides). KM#273 5 Francs. Year: 1946 - AH 1365. Weight: 12.13g [12.00g]. Metal: Aluminum-Bronze. Diameter: 31.00 mm. Edge: Plain. Alignment: Coin. Mint: Paris (wing mint mark). Obverse: "محمد الأمين مدة باي تونس" (Muhammad al-Amin as Bey of Tunisia) in Arabic as first three lines from the top. 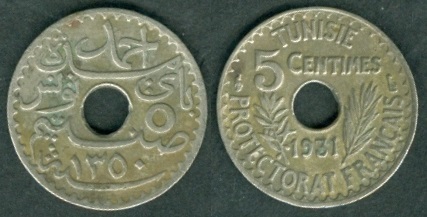 Numeral "5" value in Arabic with "فرنكات" (Francs). Date at the bottom. 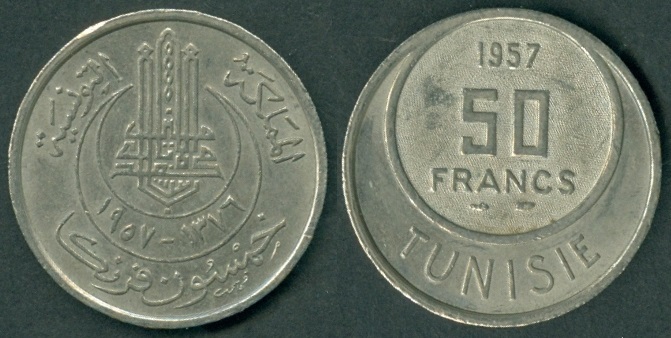 Reverse: "TUNISIE 5 FRANCS" in the center. Date below the value. "PROTECTORAT FRANÇAIS" (French Protectorate) below the Date. All these are in circular form surrounded by circular design. Mint marks at both sides at the bottom. Mintage: 10,000,000. Minted Years: One year type. Engraver: Lucien Georges Bazor (designer of both sides). KM#277 5 Francs. Year: 1954 - AH 1373. Weight: 2.30g [2.30g]. Metal: Copper-Nickel. Diameter: 18.00 mm. Edge: Reeded. Alignment: Coin. Mint: Paris (wing mint mark). 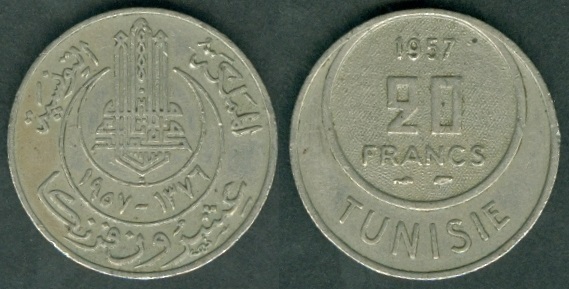 Obverse: "المملكة التونسية" (Kingdom of Tunisia) divided Arabic legend on the top. "ملك محمد الأمين" (King Muhammad al-Amin) in Arabic as design in the center. Dates in the crescent. "خمسة فرنكات" (Five Francs) written in Arabic at the bottom. Reverse: Mint marks at both sides of the Date at the top. "5 FRANCS" written in the center. "TUNISIE" at the bottom. Mintage: 18,000,000. Minted Years: 1954-AH1373 and 1957-AH1376. Engraver: Lucien Georges Bazor (designer of both sides). KM#274 20 Francs. Year: 1950 - AH 1370. Weight: 5.60g [5.60g]. Metal: Copper-Nickel. Diameter: 23.00 mm. Edge: Reeded. Alignment: Coin. Mint: Paris (wing mint mark). 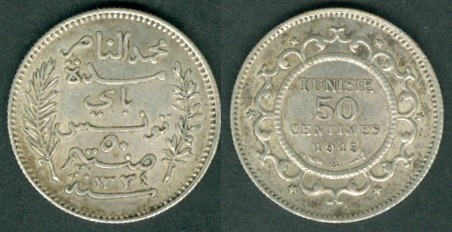 Obverse: "المملكة التونسية" (Kingdom of Tunisia) divided Arabic legend on the top. "ملك محمد الأمين" (King Muhammad al-Amin) in Arabic as design in the center. Dates in the crescent. "عشرون فرنكا" (Twenty Francs) written in Arabic at the bottom. Reverse: Date at the top. "20 FRANCS" written in the center with mint marks below it. "TUNISIE" at the bottom. Mintage: 10,000,000. Minted Years: 1950-AH1370 and 1957-AH1376. Engraver: Lucien Georges Bazor (designer of both sides). KM#275 50 Francs. Year: 1950 - AH 1370. Weight: 8.00g [8.00g]. Metal: Copper-Nickel. Diameter: 27.00 mm. Edge: Reeded. Alignment: Coin (wing mint mark). Mint: Paris. 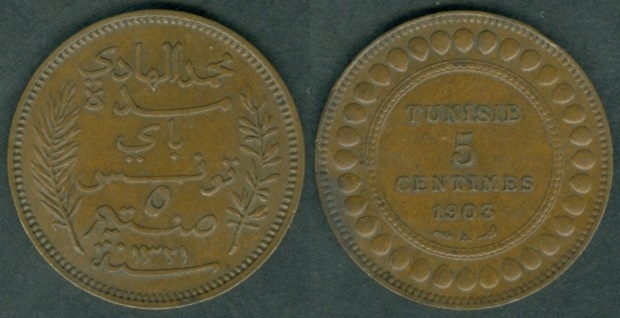 Obverse: "المملكة التونسية" (Kingdom of Tunisia) divided Arabic legend on the top. "ملك محمد الأمين" (King Muhammad al-Amin) in Arabic as design in the center. "خمسين فرنك" (Fifty Francs) written in Arabic at the bottom. Dates in the crescent. Reverse: Date at the top. "50 FRANCS" written in the center with mint marks below it. "TUNISIE" at the bottom. Mintage: 5,000,000. Minted Years: 1950-AH1370 and 1957-AH1376. Engraver: Lucien Georges Bazor (designer of both sides). KM#276 100 Francs. Year: 1950 - AH 1370. Weight: 12.00g [12.00g]. Metal: Copper-Nickel. Diameter: 31.00 mm. Edge: Reeded. Alignment: Coin (wing mint mark). Mint: Paris. 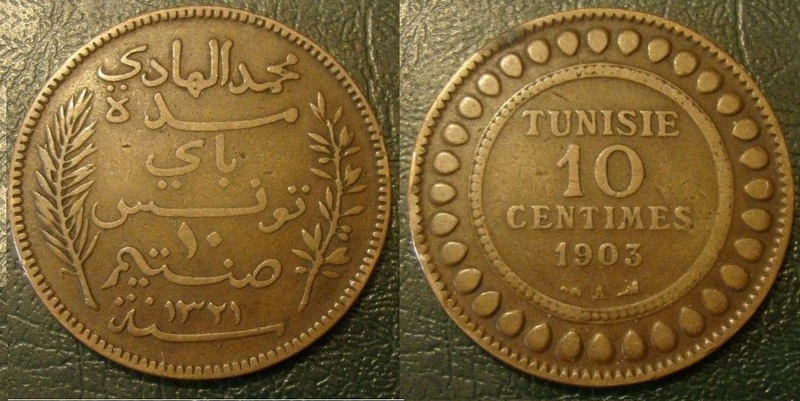 Obverse: "المملكة التونسية" (Kingdom of Tunisia) divided Arabic legend on the top. "ملك محمد الأمين" (King Muhammad al-Amin) in Arabic as design in the center. Dates in the crescent. "مائة فرنك" (One Hundred Francs) written in Arabic at the bottom. Reverse: Date at the top. "100 FRANCS" written in the center with mint marks below it. "TUNISIE" at the bottom. Mintage: 8,000,000. Minted Years: 1950-AH1370 and 1957-AH1376. Engraver: Lucien Georges Bazor (designer of both sides). 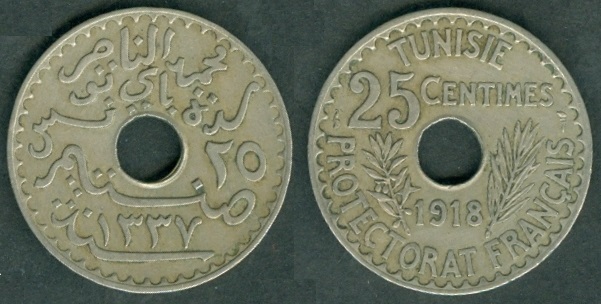 Muhammad Al-Amin Bey coinage of 1957 as Independent ruler. KM#277 5 Francs. Year: 1957 - AH 1376. Weight: 2.33g [2.30g]. Metal: Copper-Nickel. Diameter: 18.00 mm. Edge: Reeded. Alignment: Coin. Mint: Paris (wing mint mark). 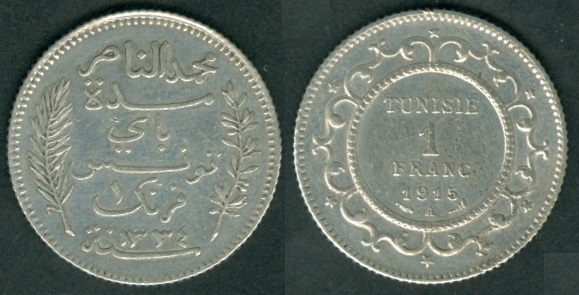 Obverse: "المملكة التونسية" (Kingdom of Tunisia) divided Arabic legend on the top. "ملك محمد الأمين" (King Muhammad al-Amin) in Arabic as design in the center. Dates in the crescent. "خمسة فرنكات" (Five Francs) written in Arabic at the bottom. Reverse: Mint marks at both sides of the Date at the top. "5 FRANCS" written in the center. "TUNISIE" at the bottom. Mintage: 4,000,000. Minted Years: 1954-AH1373 and 1957-AH1376. Engraver: Lucien Georges Bazor (designer of both sides). KM#274 20 Francs. Year: 1957 - AH 1376. Weight: 5.51g [5.60g]. Metal: Copper-Nickel. Diameter: 23.00 mm. Edge: Reeded. Alignment: Coin (wing mint mark). Mint: Paris. 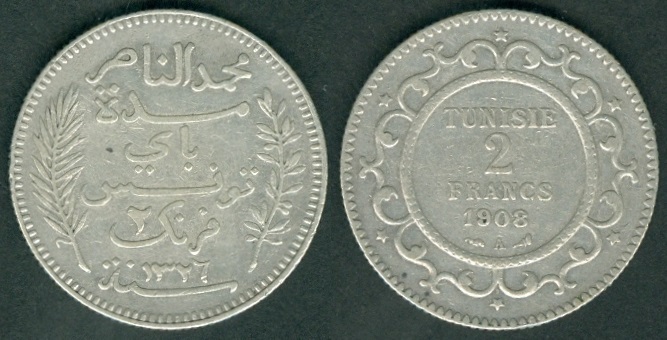 Obverse: "المملكة التونسية" (Kingdom of Tunisia) divided Arabic legend on the top. "ملك محمد الأمين" (King Muhammad al-Amin) in Arabic as design in the center. Dates in the crescent. "عشرون فرنكا" (Twenty Francs) written in Arabic at the bottom. Reverse: Date at the top. "20 FRANCS" written in the center with mint marks below it. "TUNISIE" at the bottom. Mintage: 600,000. Minted Years: 1950-AH1370 and 1957-AH1376. Engraver: Lucien Georges Bazor (designer of both sides). KM#275 50 Francs. Year: 1957 - AH 1376. Weight: 8.04g [8.00g]. Metal: Copper-Nickel. Diameter: 27.00 mm. Edge: Reeded. Alignment: Coin (wing mint mark). Mint: Paris. 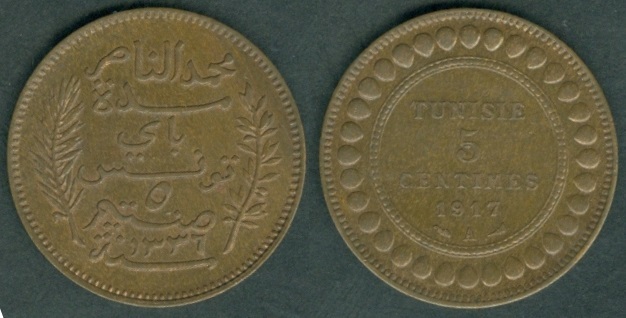 Obverse: "المملكة التونسية" (Kingdom of Tunisia) divided Arabic legend on the top. "ملك محمد الأمين" (King Muhammad al-Amin) in Arabic as design in the center. "خمسين فرنك" (Fifty Francs) written in Arabic at the bottom. Dates in the crescent. Reverse: Date at the top. "50 FRANCS" written in the center with mint marks below it. "TUNISIE" at the bottom. Mintage: 600,000. Minted Years: 1950-AH1370 and 1957-AH1376. Engraver: Lucien Georges Bazor (designer of both sides). He was the third son of Muhammad V an-Nasir, Bey of Tunis, by his second wife, Lalla Husn ul-Ujud.